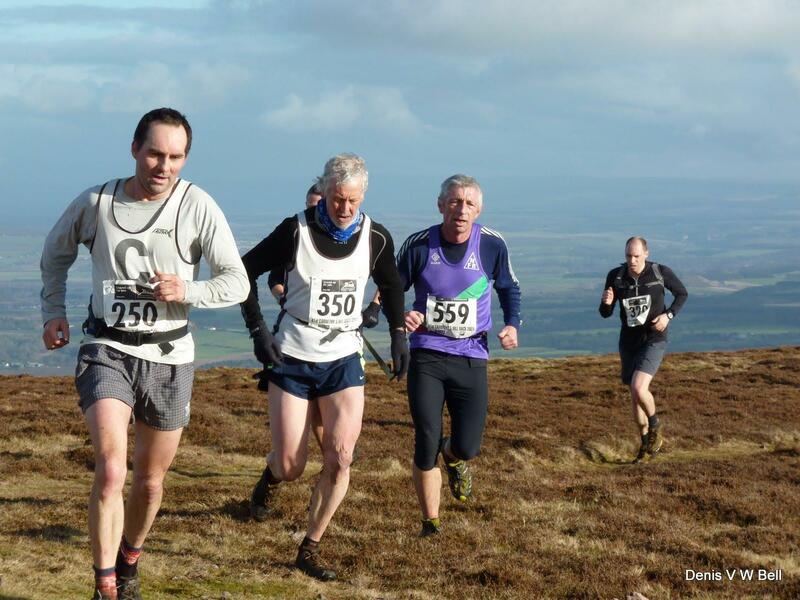 “Although a relatively short race, the route can be exposed to full winter conditions. 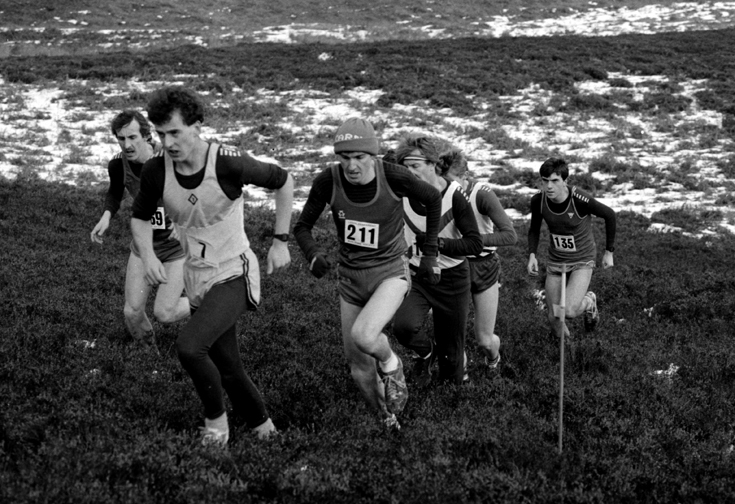 Breaking the hour is the target for stronger runners in the field. 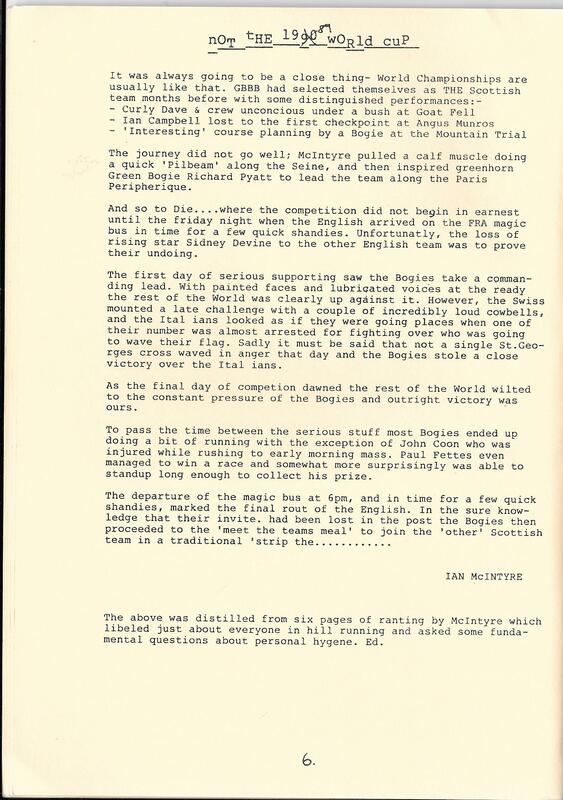 The startline is something to behold. 500 runners like extras from Braveheart lined up for battle, fittingly at the site of The Battle of Roslin. 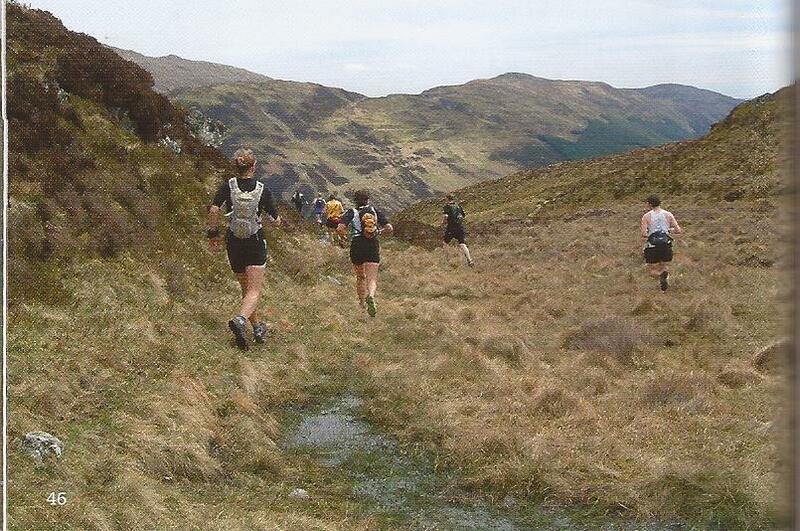 The race starts with a chaotic charge across flat marshland for the gateway to the hill. 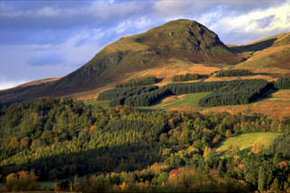 Then steep climbing up Scald Law in a heather trod where passing is awkward. 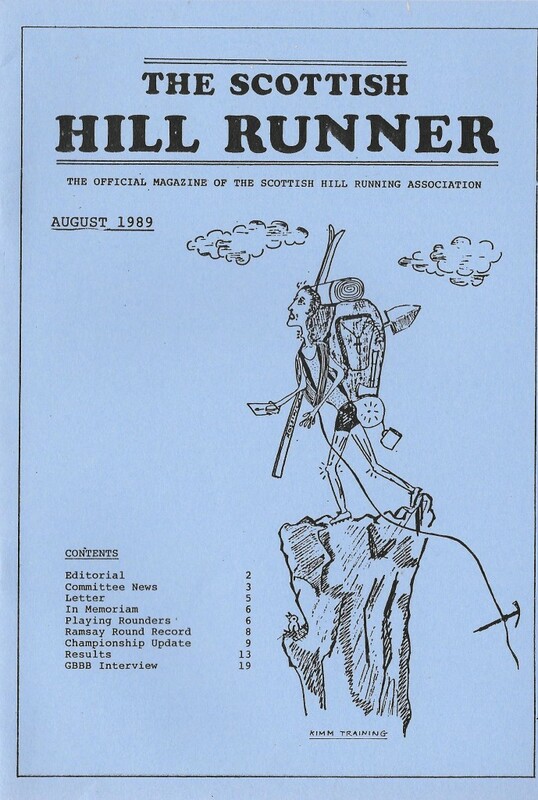 Once at the summit of Scald Law you are exposed to any freezing cold northerly winds for the ridge run to South Black and the Kips. 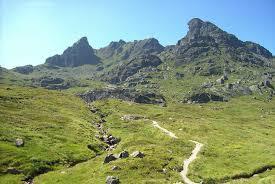 From the top of West Kip drop rapidly to pick up the trail and fast running down to the Howe. How short is ‘relatively short? 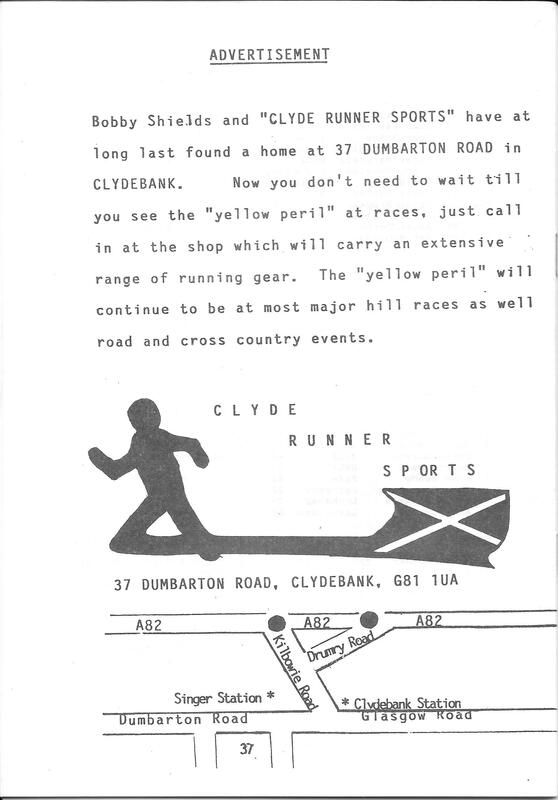 Well, they say it is 9.1 km, and Gifford Kerr’s excellent guide of 1988 says it is 6 miles. So, say 6-ish. 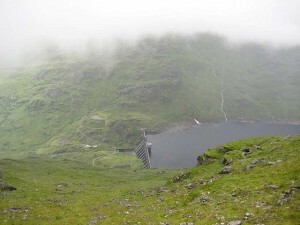 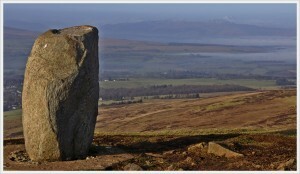 The climb is listed as 750m on the SHR website and 2500 feet in Kerr. 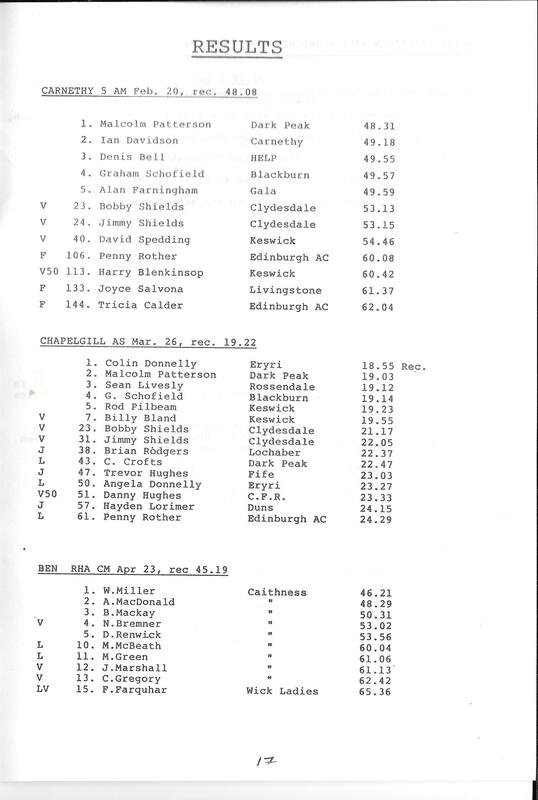 The current best times for men and women are both quite long standing: the men’s was run by Gavin Bland in 1999 and is 46:56 with Angela Mdge holding the women’s record of 54:20 set in 2002. 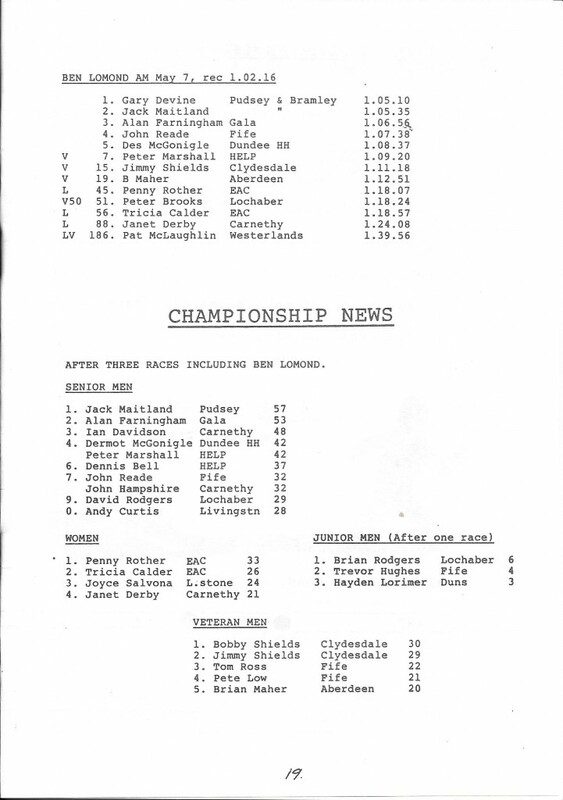 Despite the two ‘big track names’ at the front in the inaugural race it has resisted the attentions of road and cross-country champions and become a genuine specialists race. 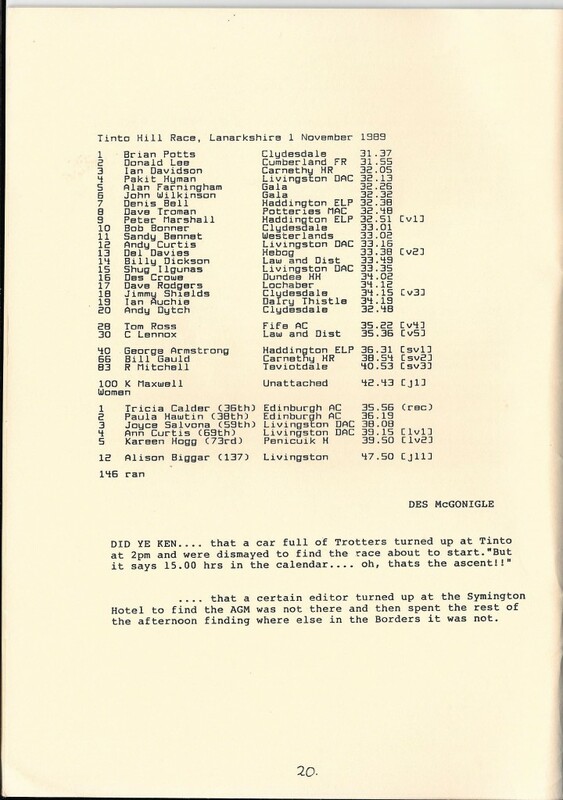 many such as Alistair Blamire (winner in 1975) and Colin Youngson have run it, few have returned and even fewer have picked up an individual award. 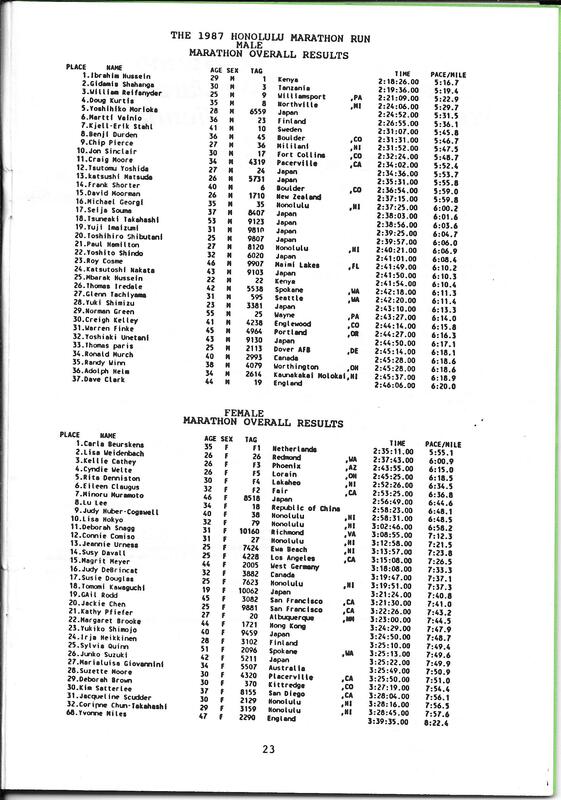 There were only 75 finishers, all Senior Men, in that first year; last year, 2013, there were 530 finishers including Juniors and Seniors of both genders and all ages down to veteran categories for men over 70 and women over 60. 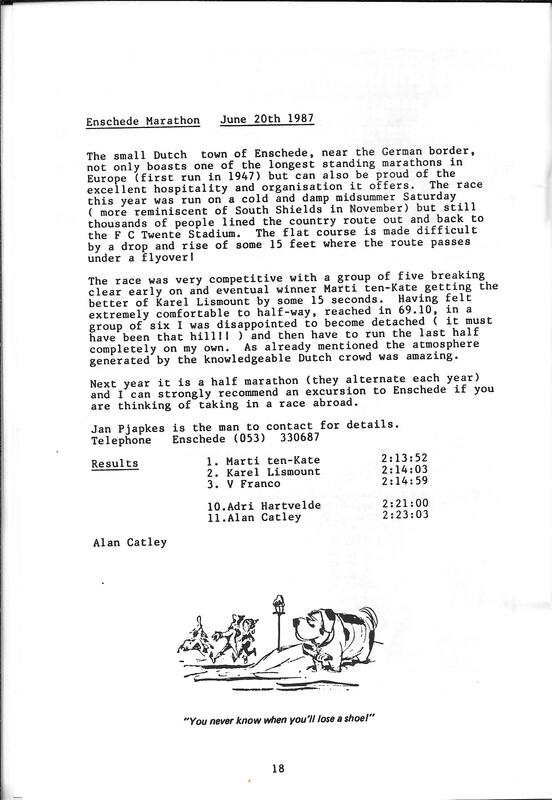 The race is now famous for its mass start. 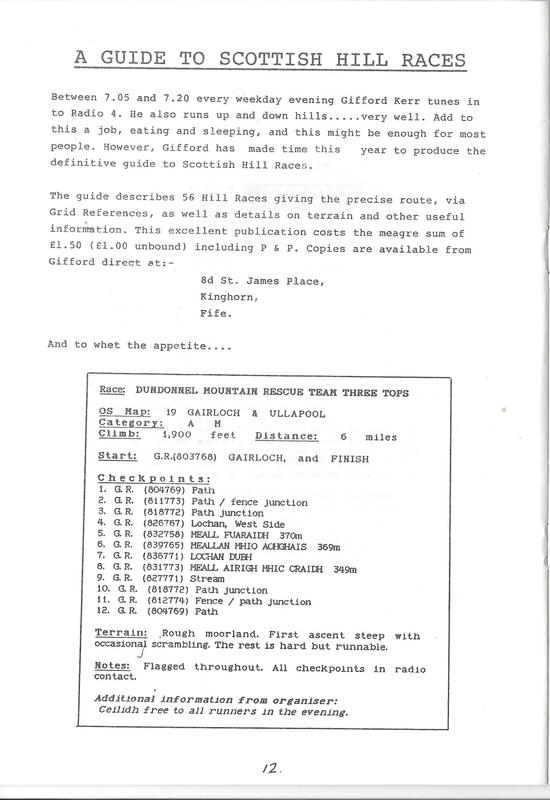 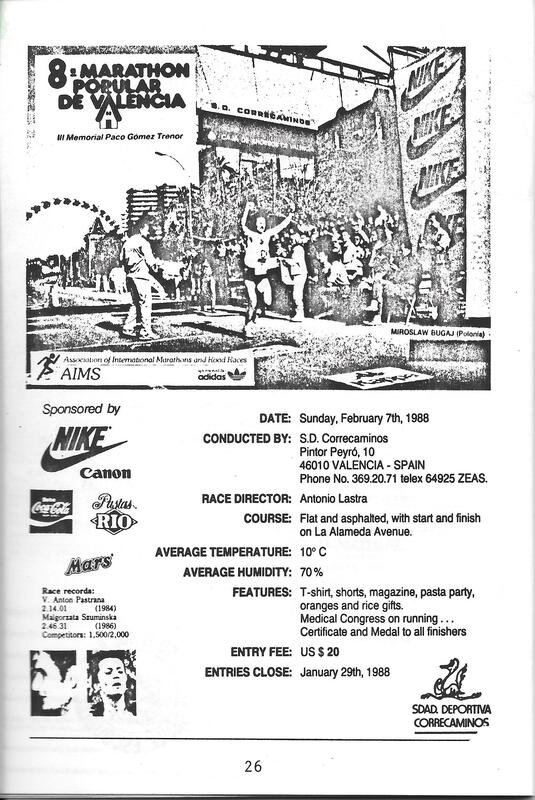 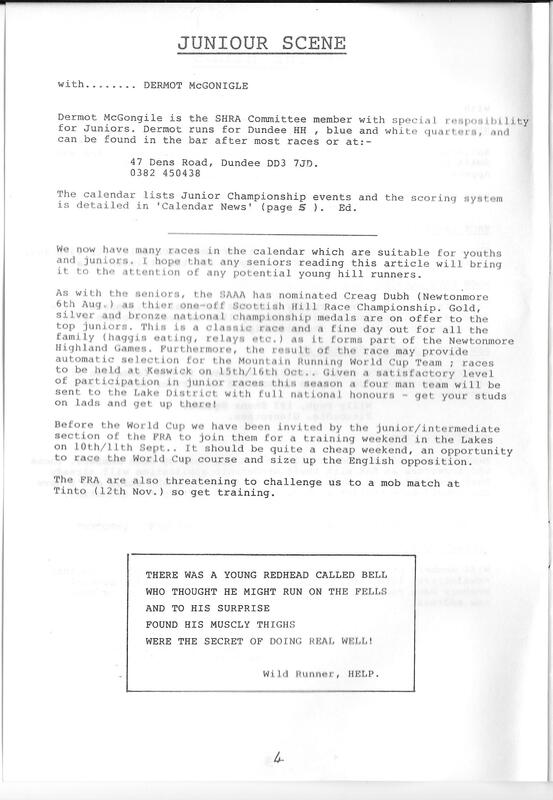 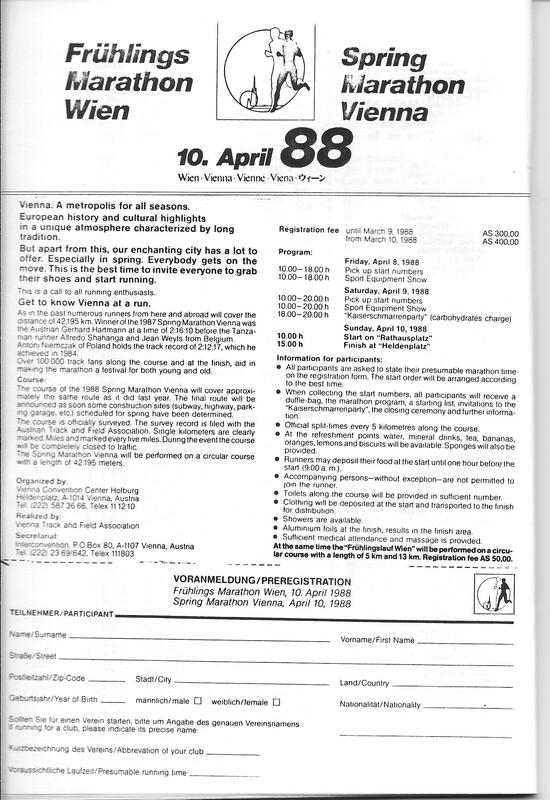 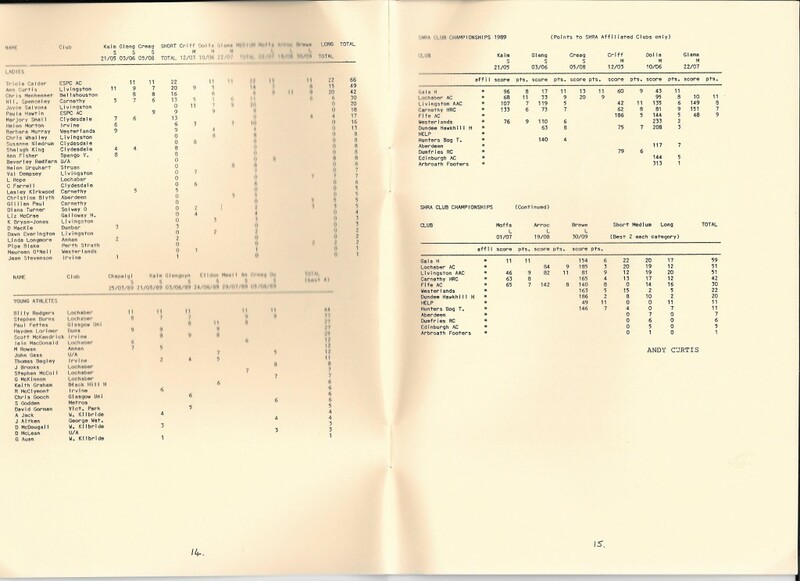 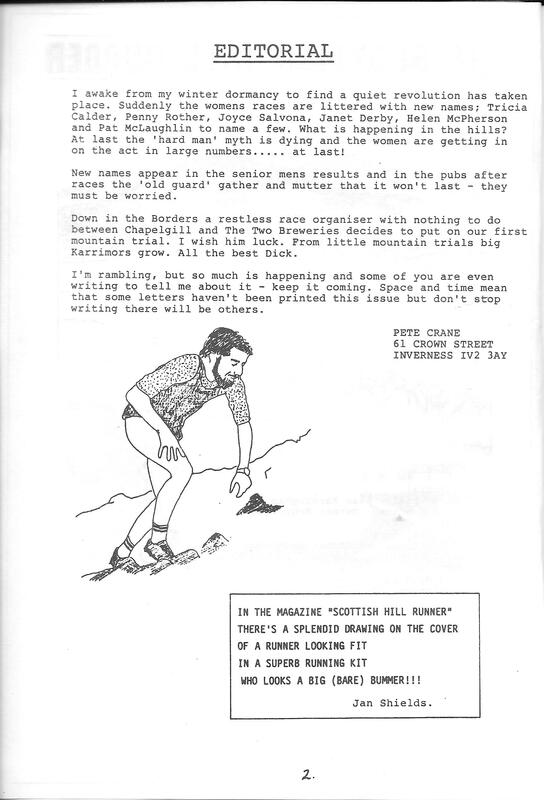 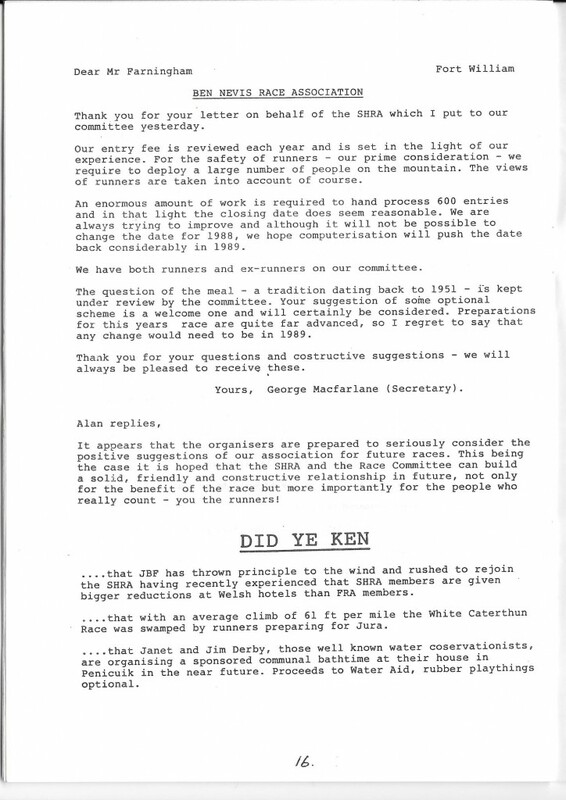 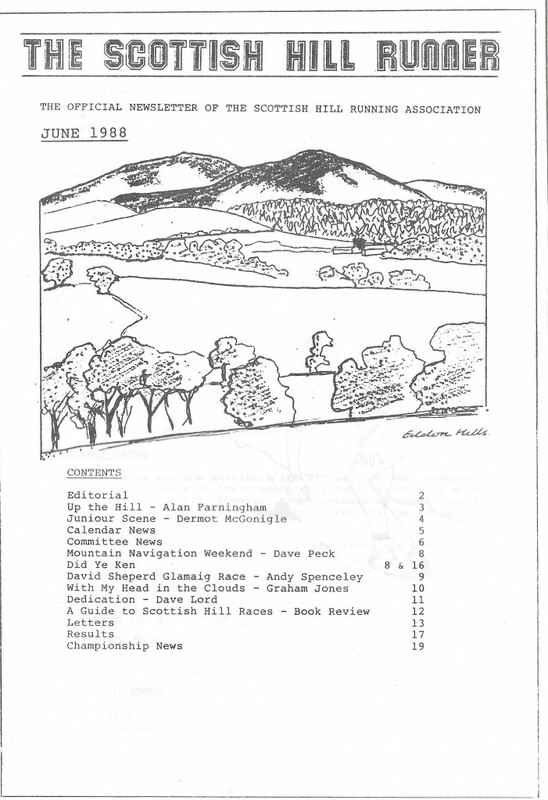 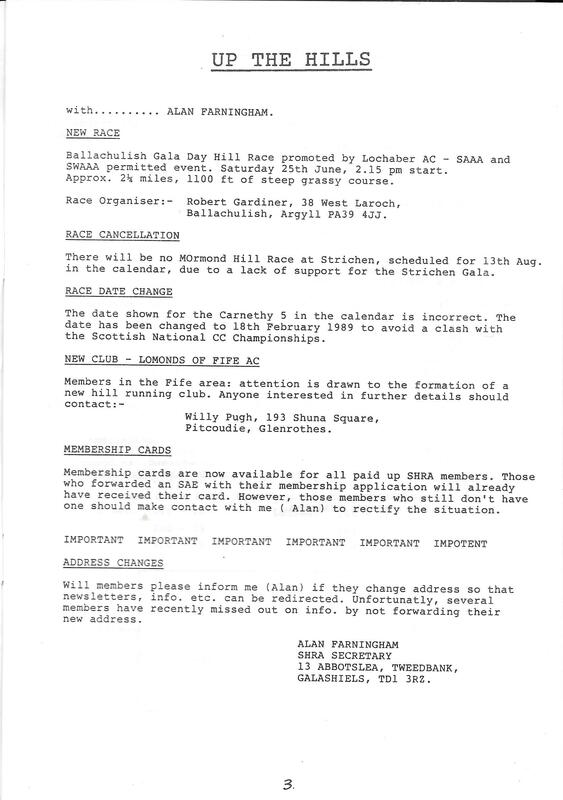 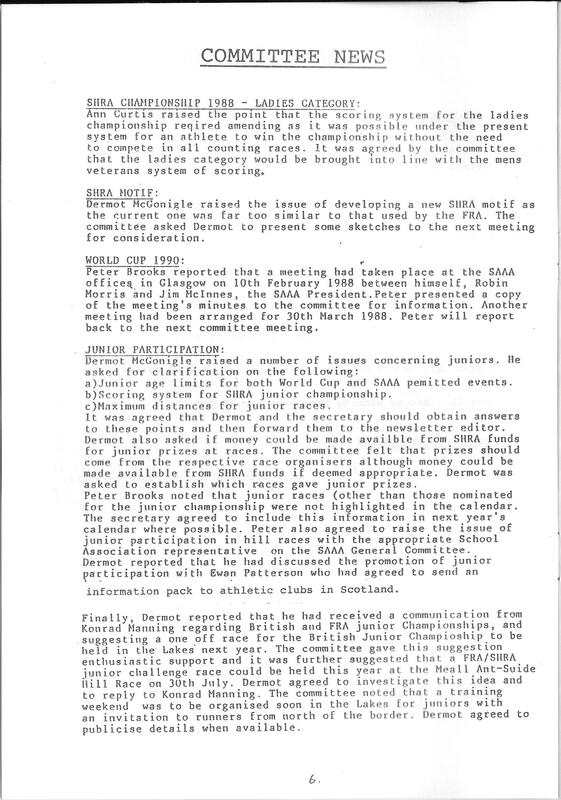 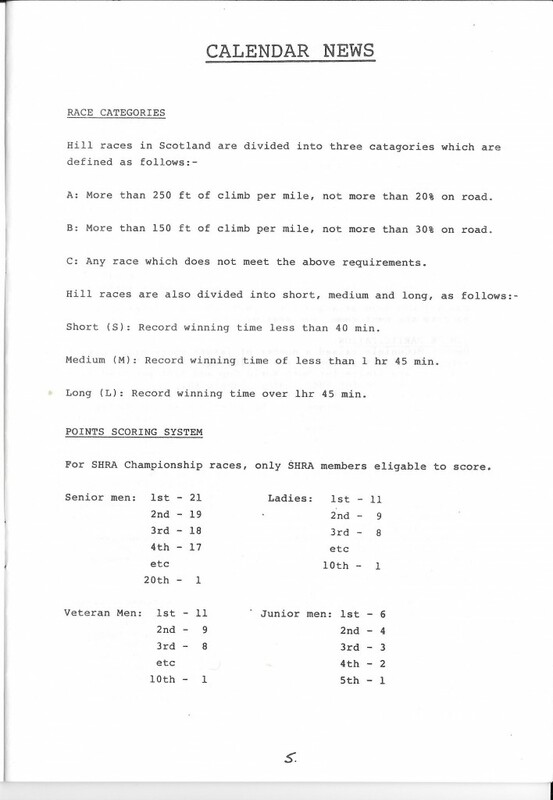 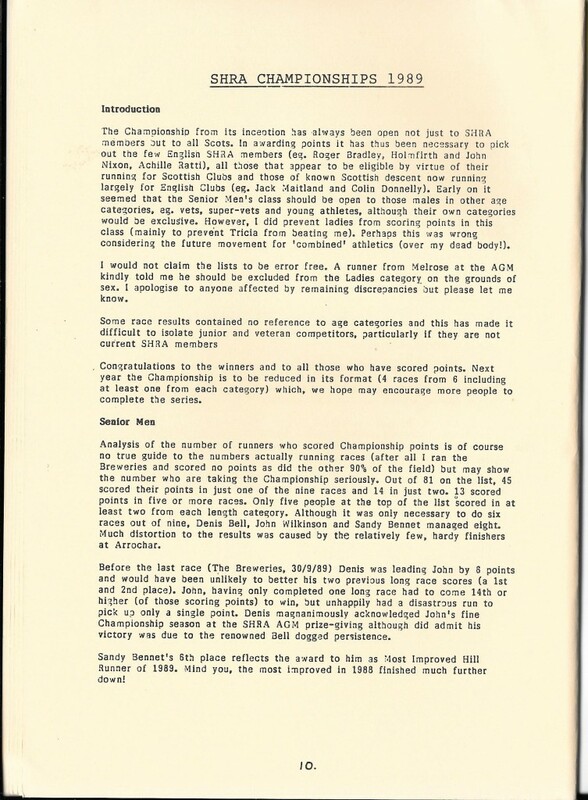 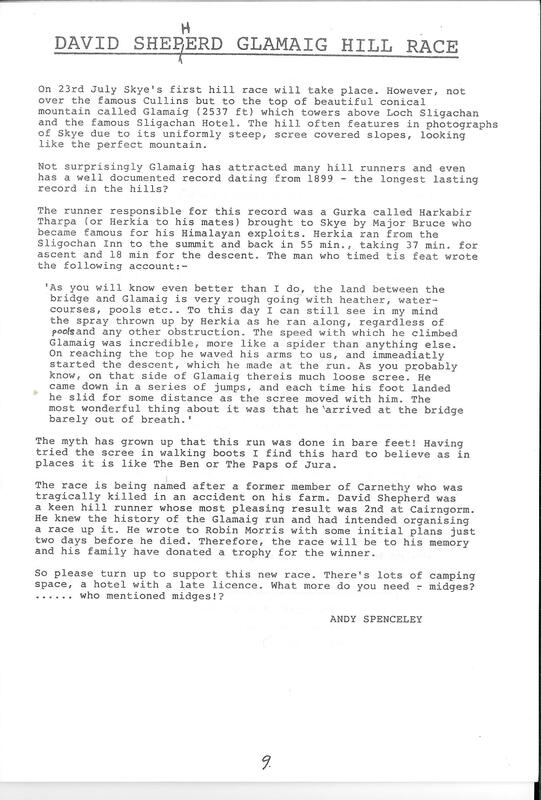 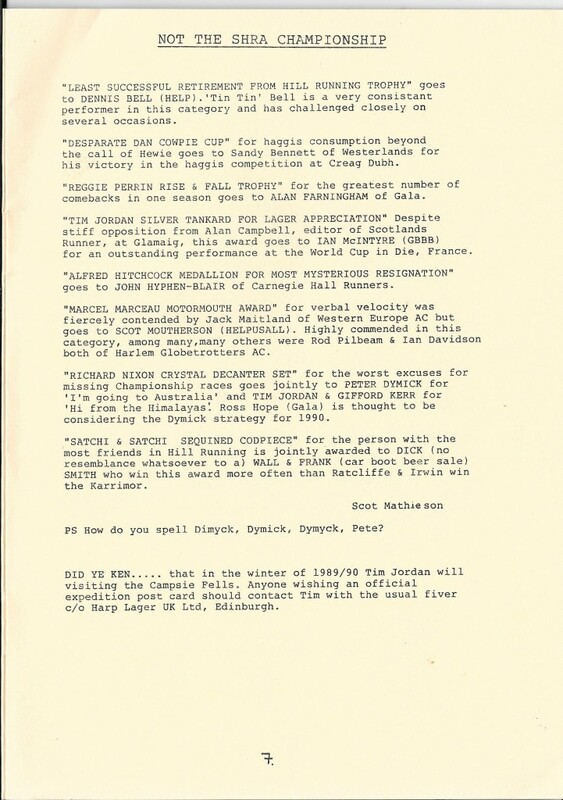 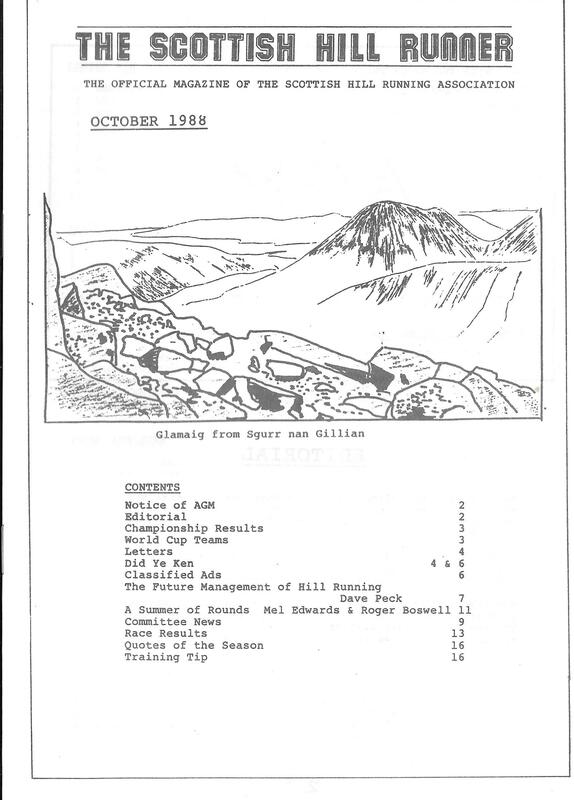 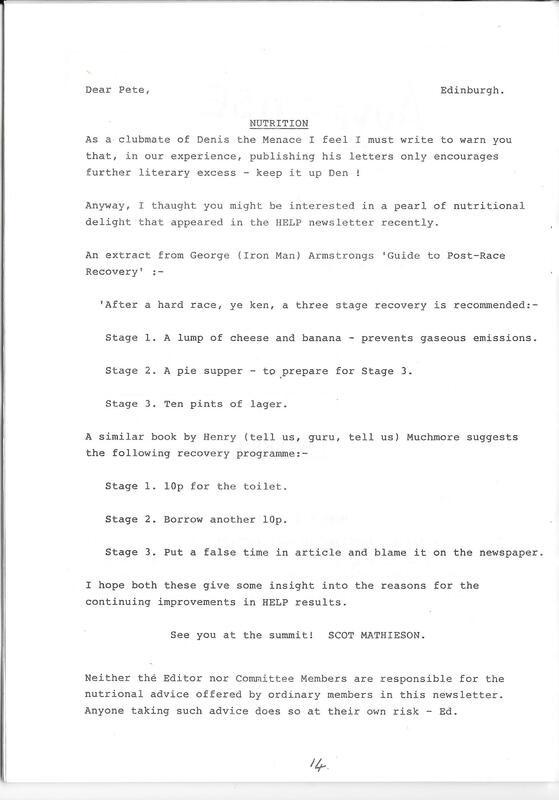 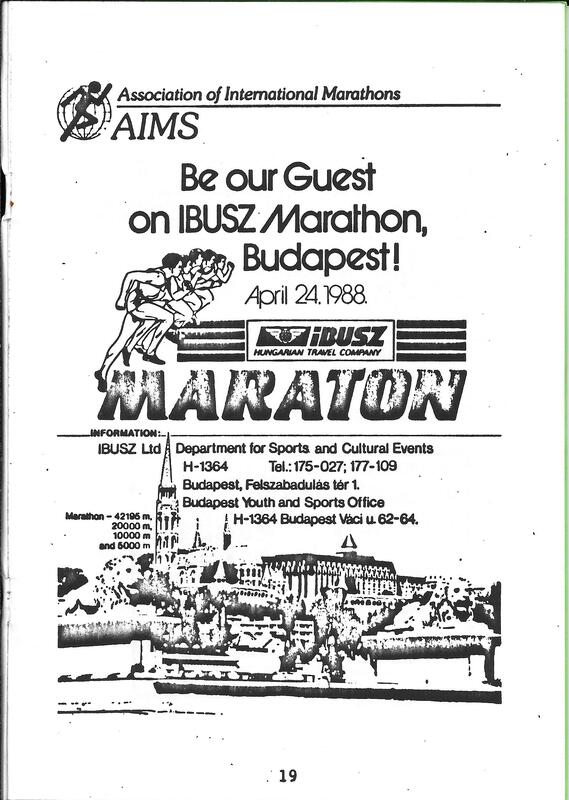 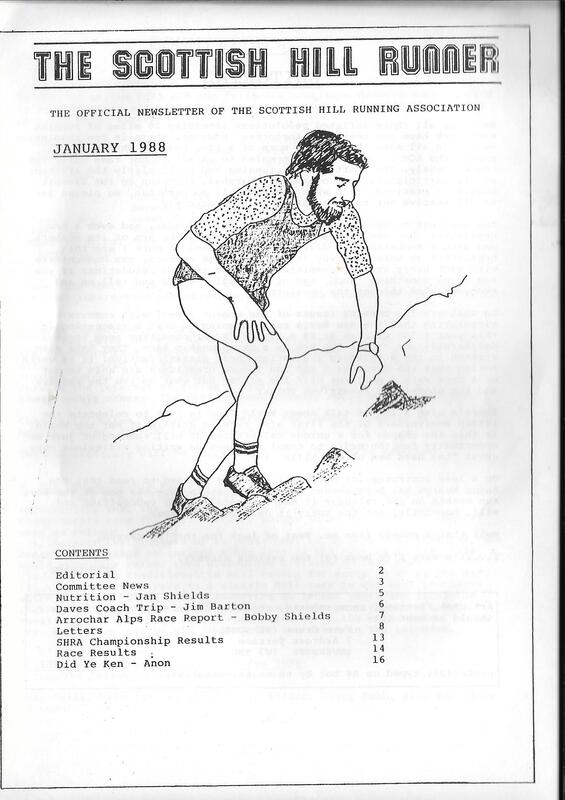 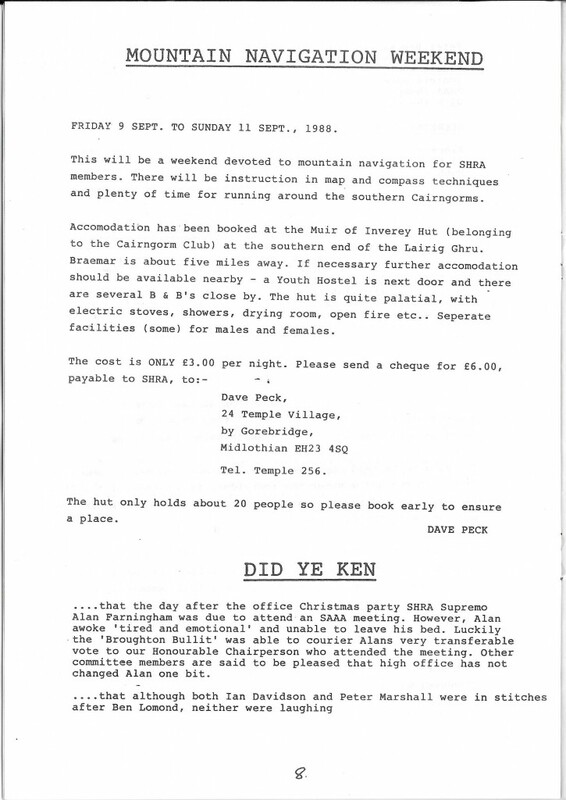 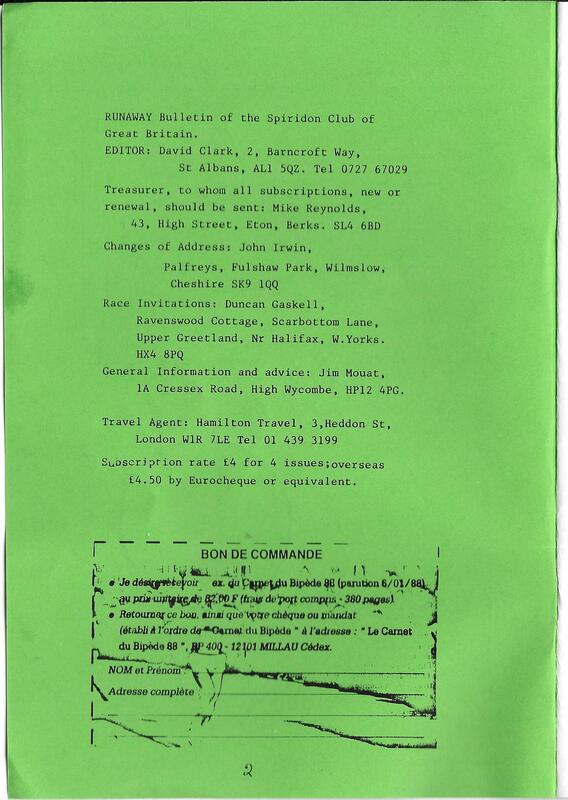 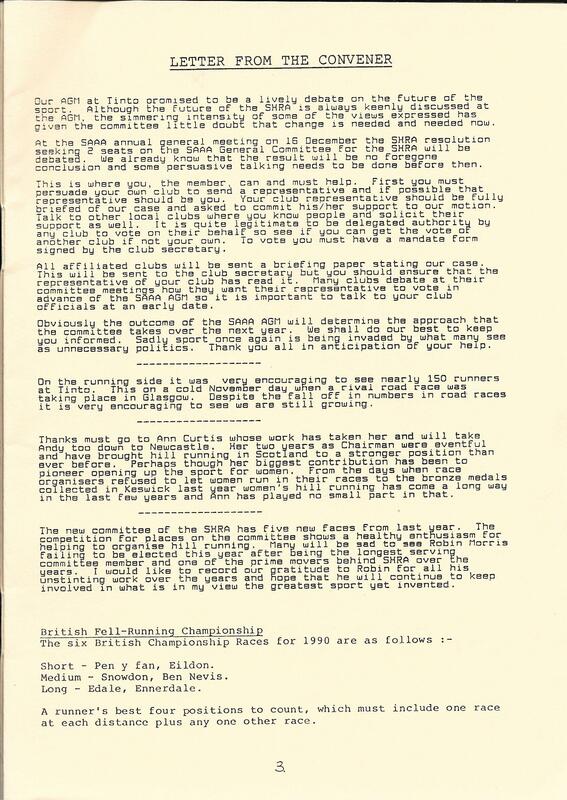 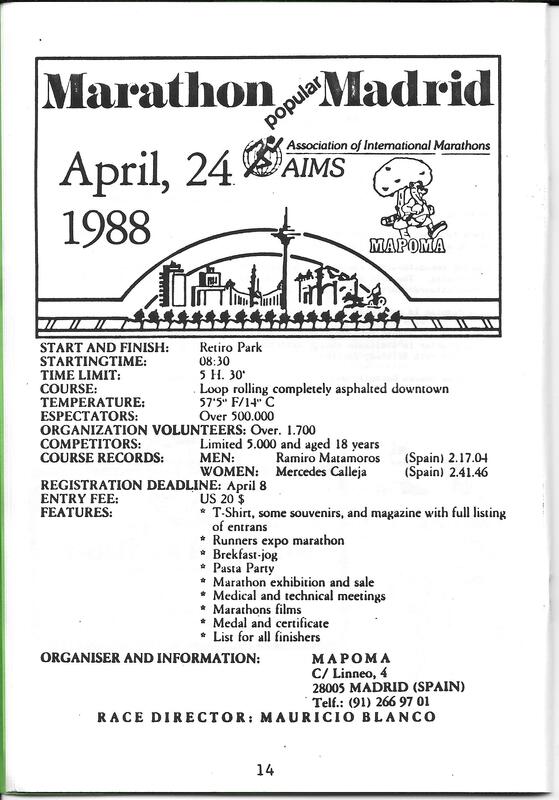 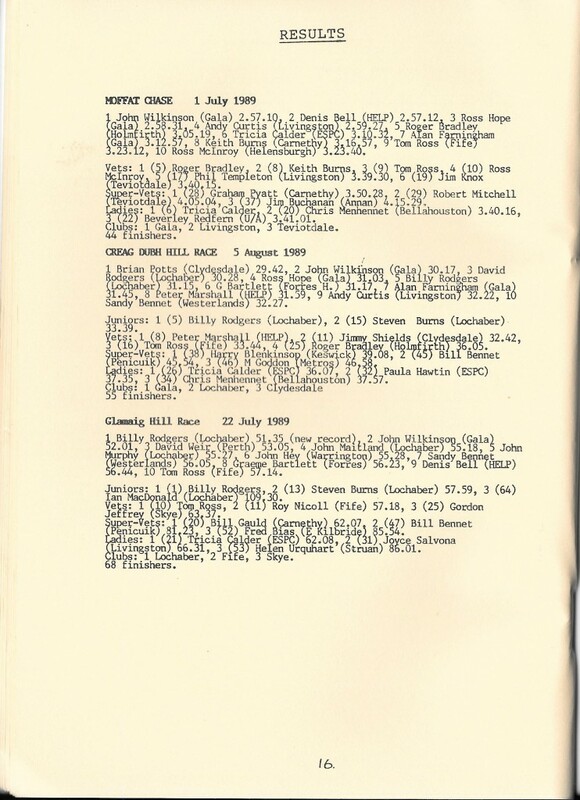 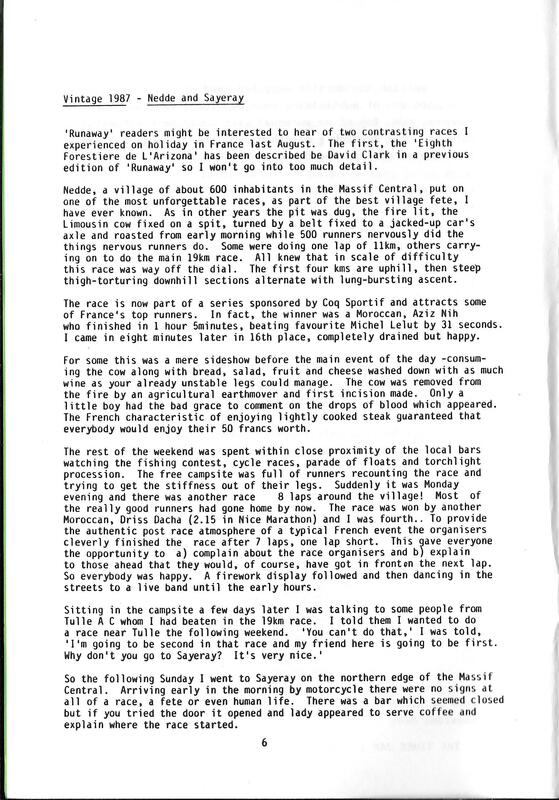 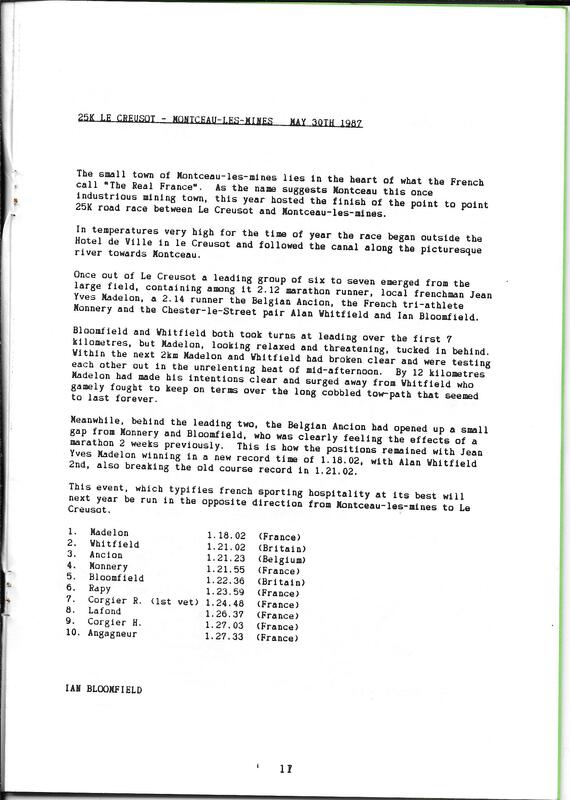 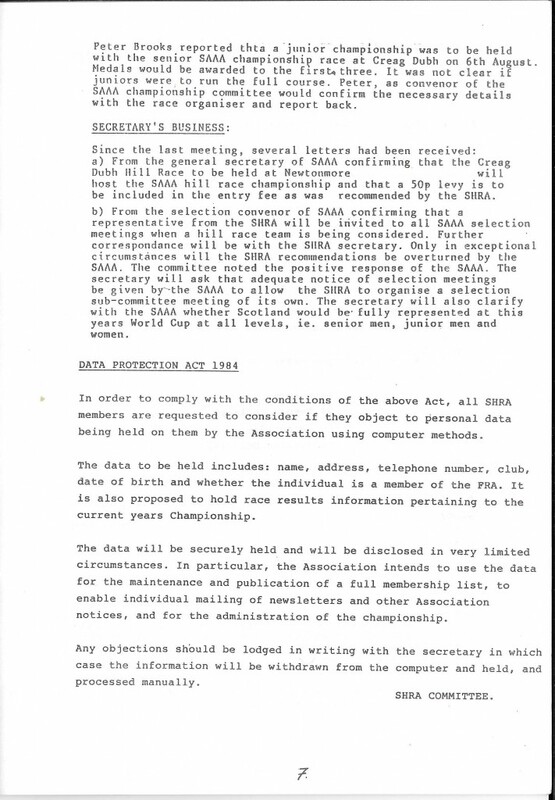 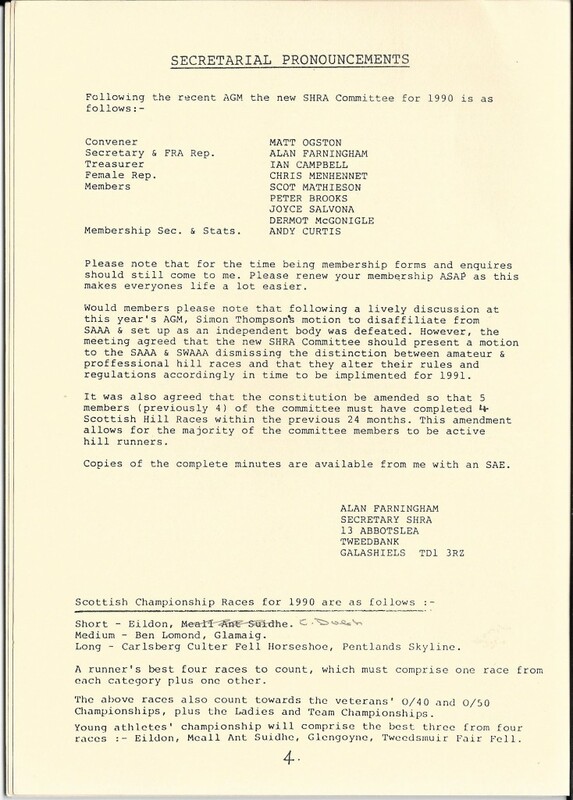 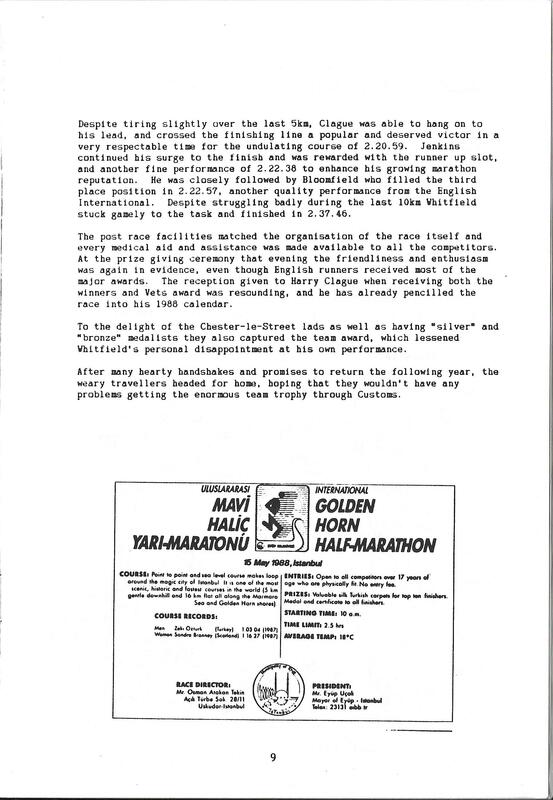 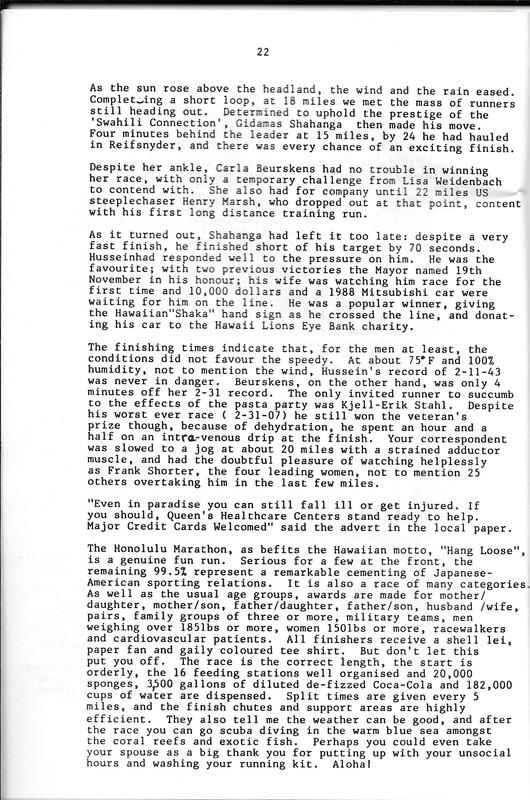 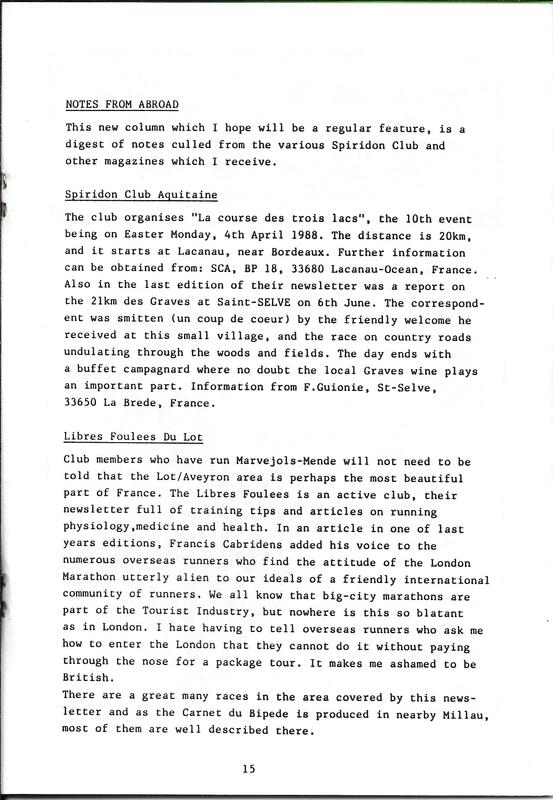 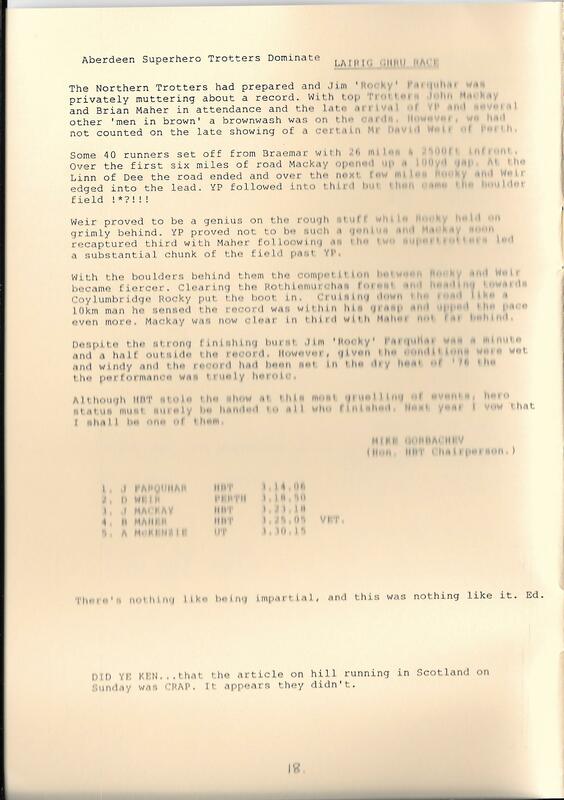 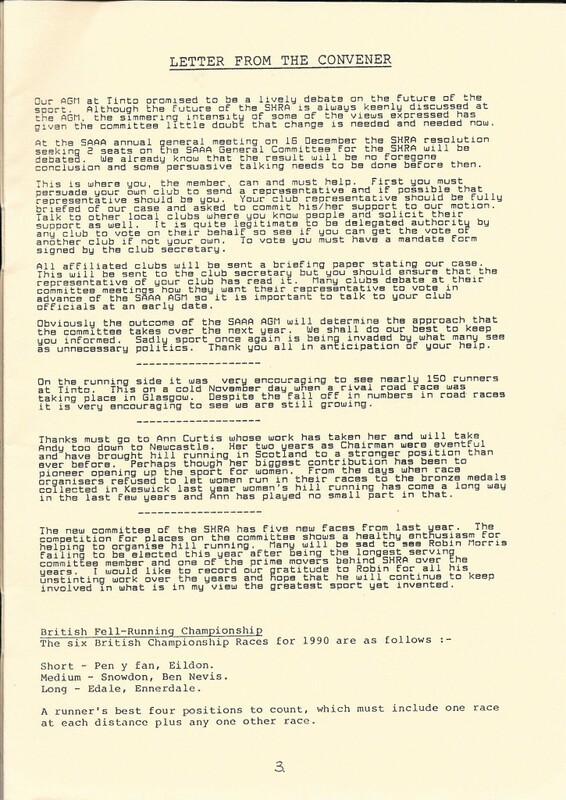 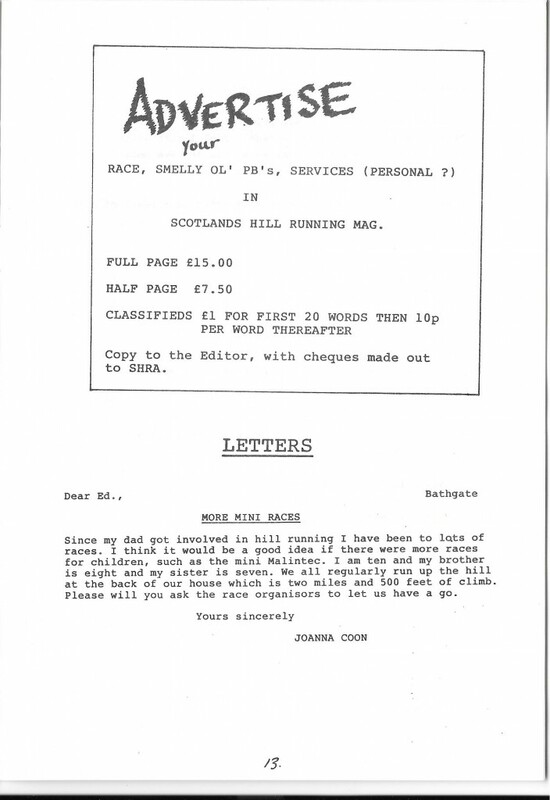 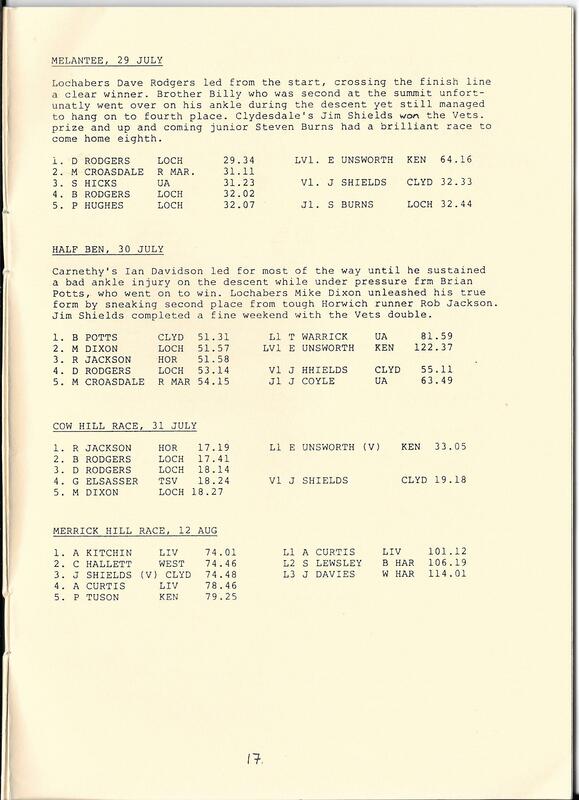 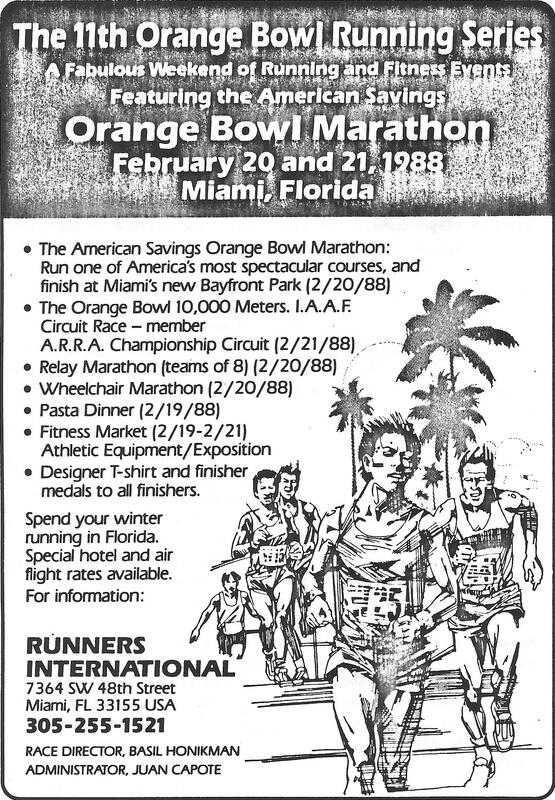 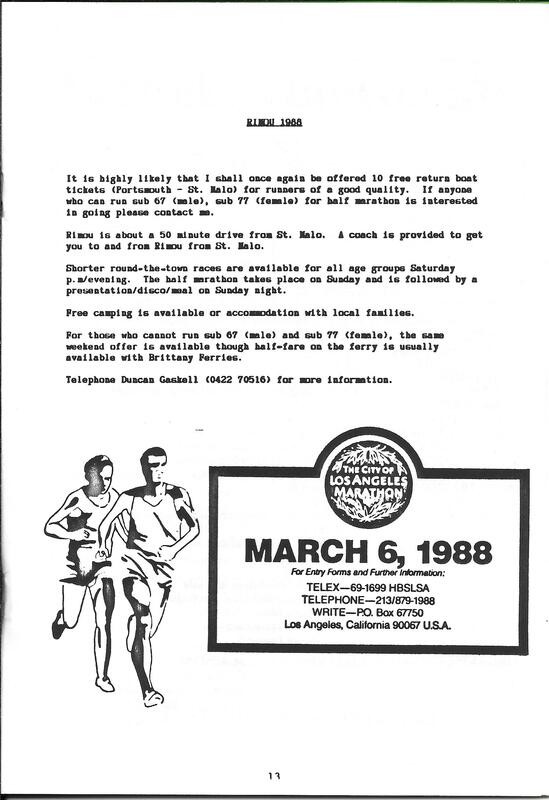 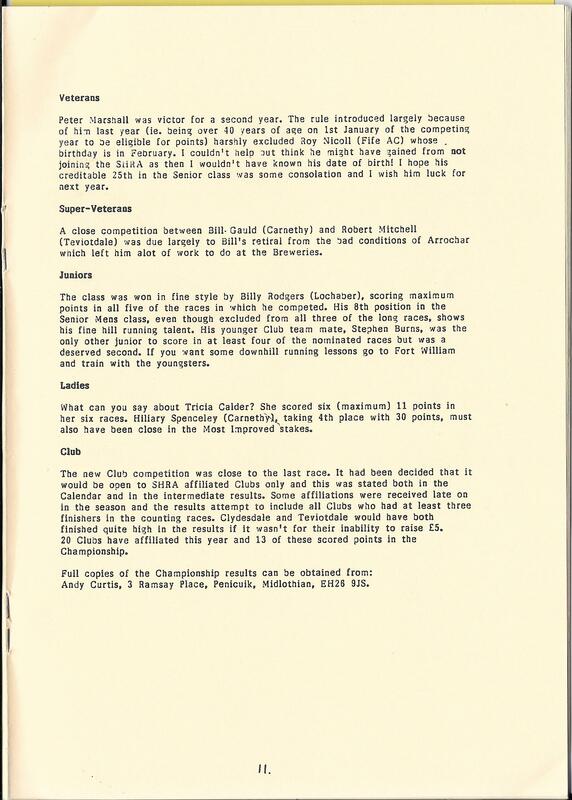 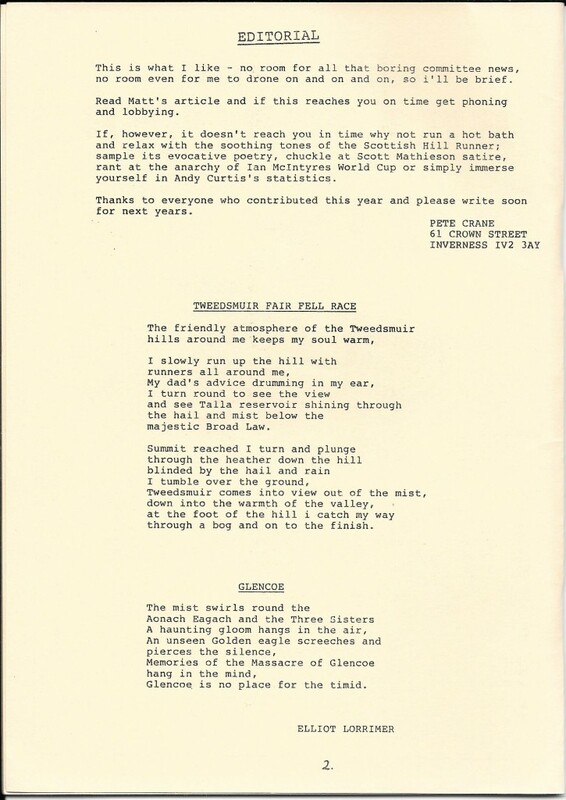 In 1987 the race organisers produced their first professional programme and were inspired by the reaction to it to provide some background information in the superb 1988 programme. 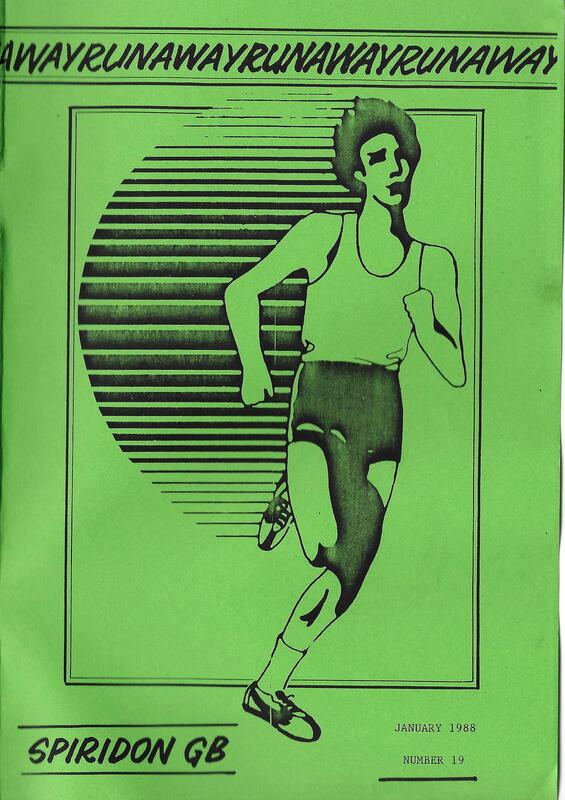 This ran to 28 pages plus a stiff card cover and I will reproduce some of the content here. 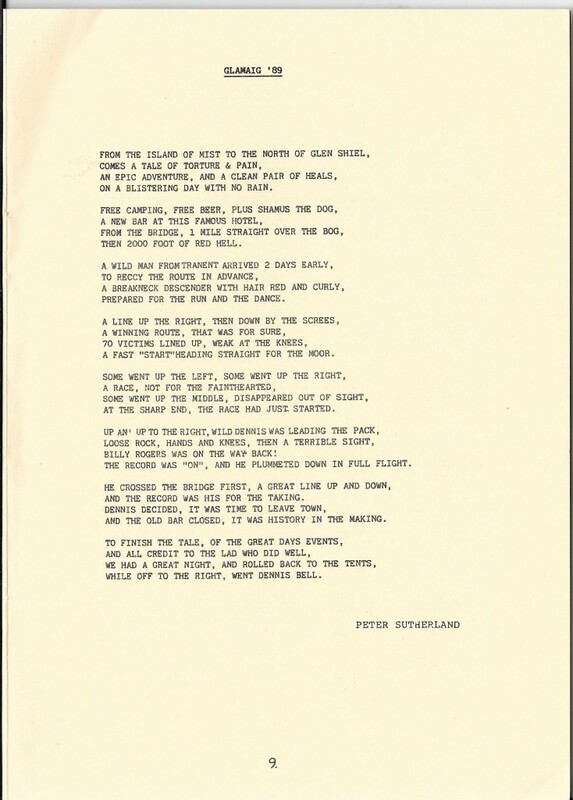 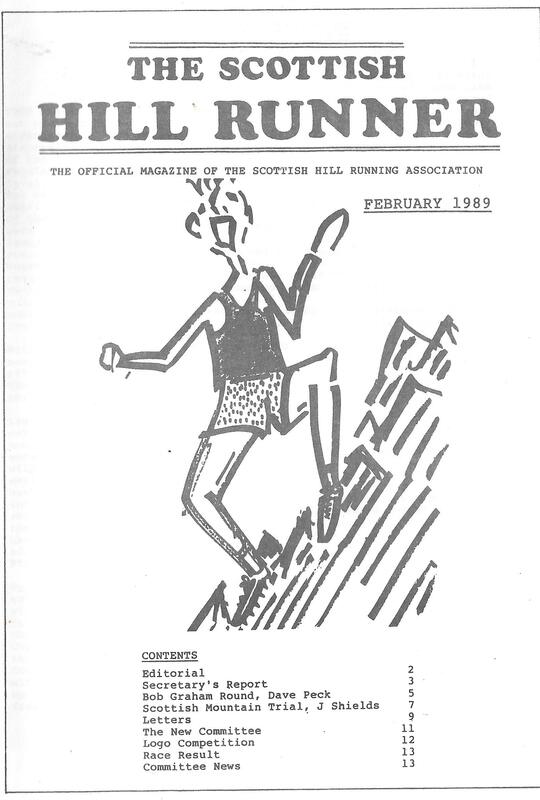 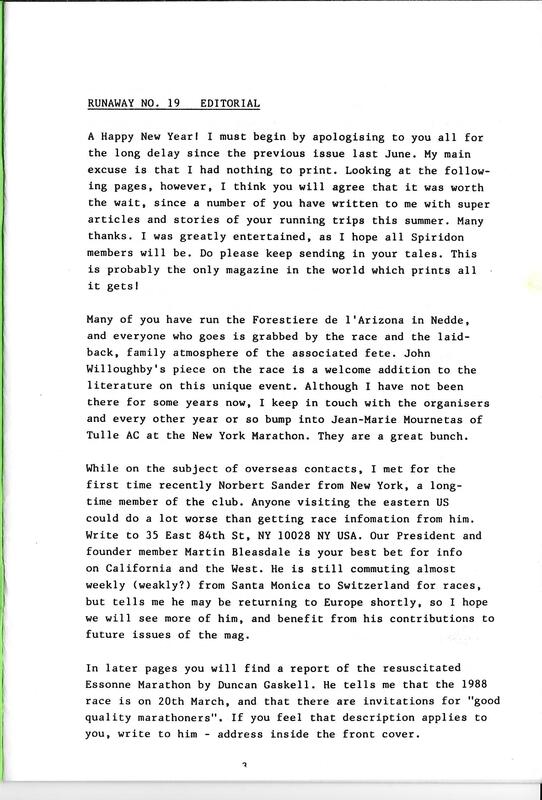 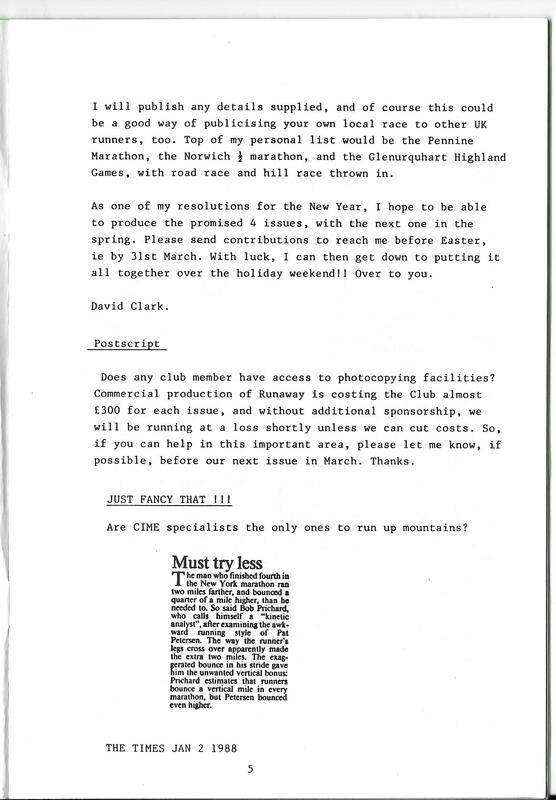 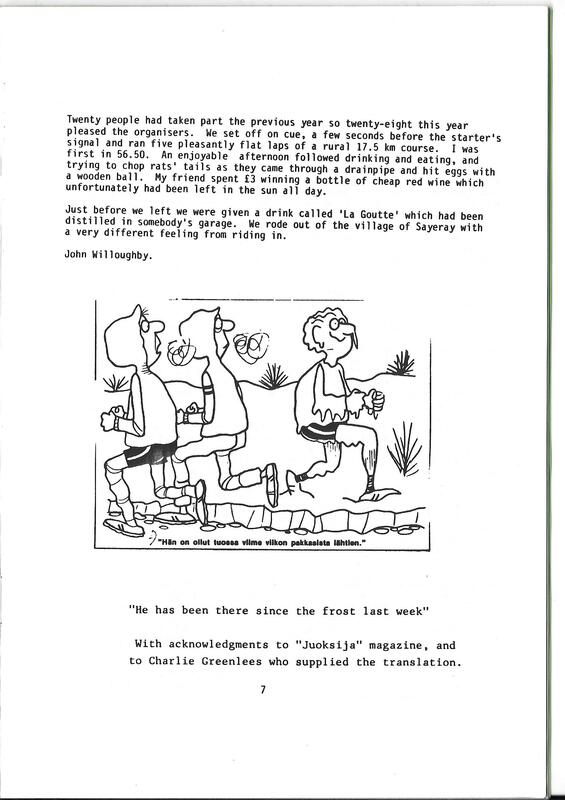 The original idea for a hill race in the Pentlands came from Jimmy Jardine (at that time in 1970 a member of the Octavians AC) . 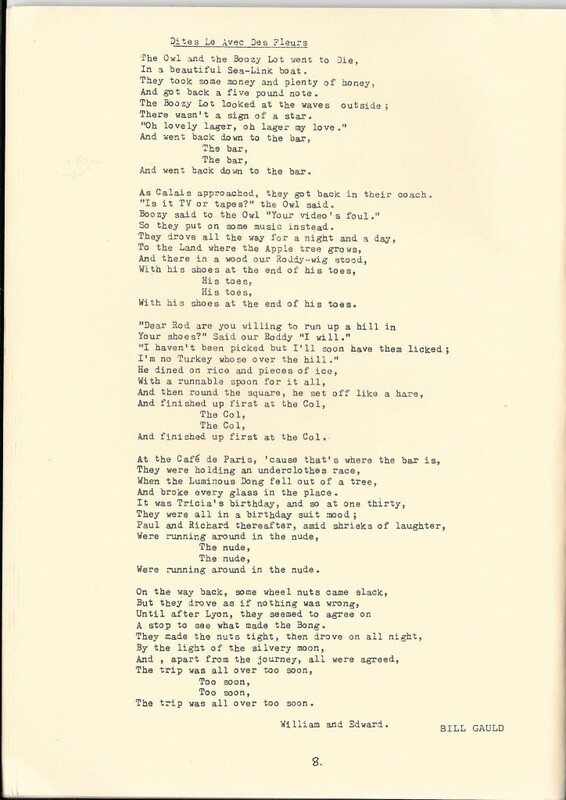 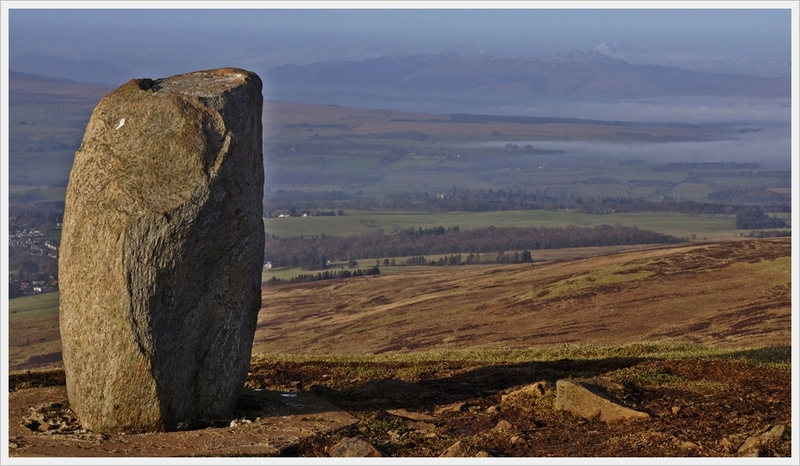 He was then travelling all over the country competing in both hill and fell events and it was always in his thoughts that there ought to be some form of hill race close to where he resided in Penicuik. 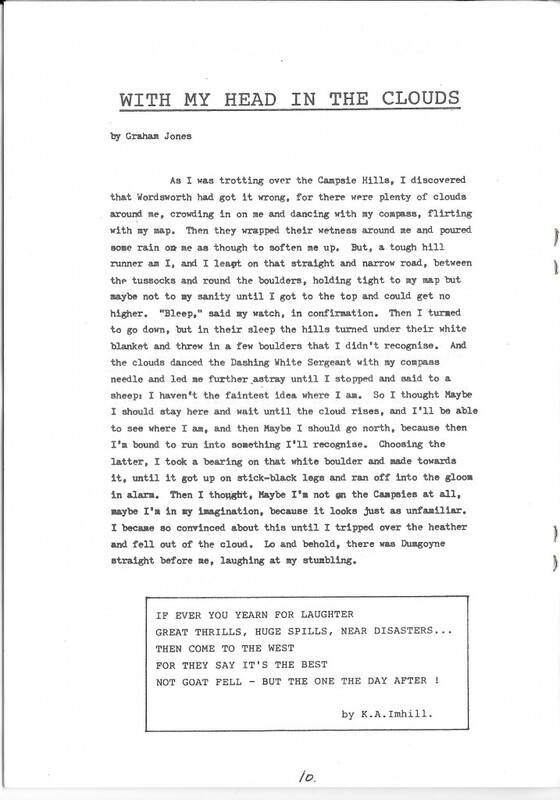 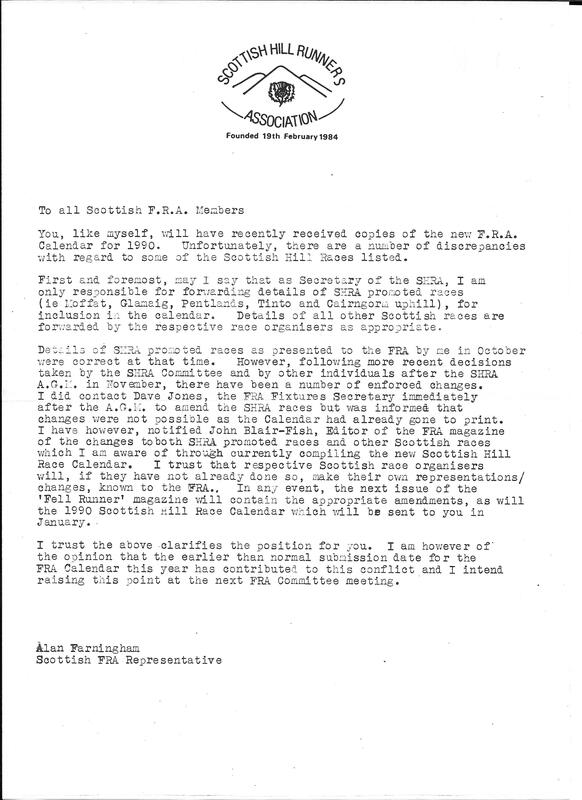 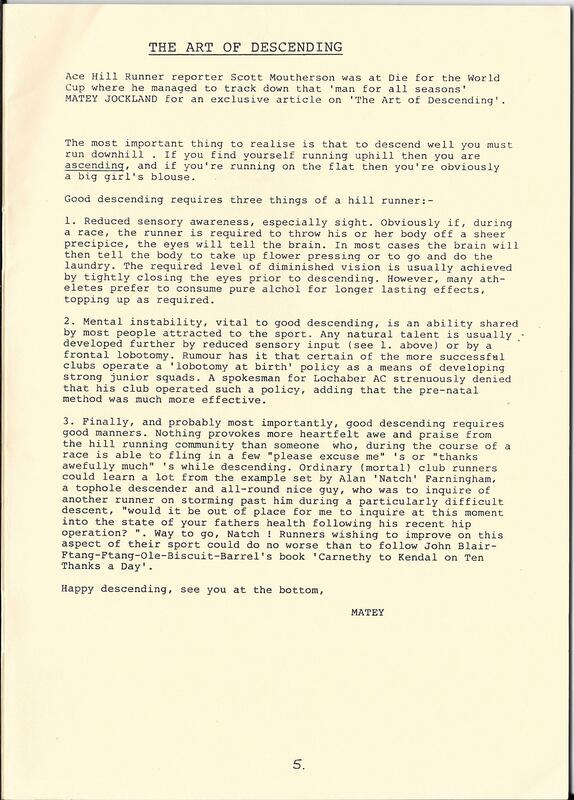 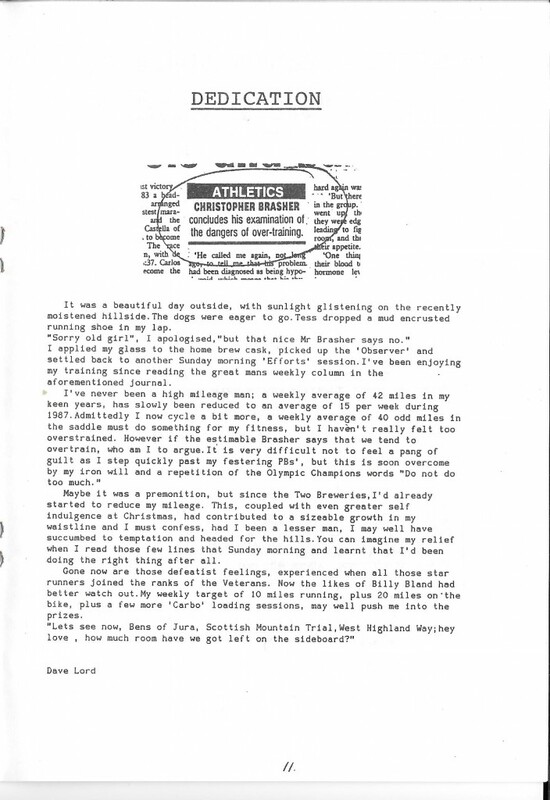 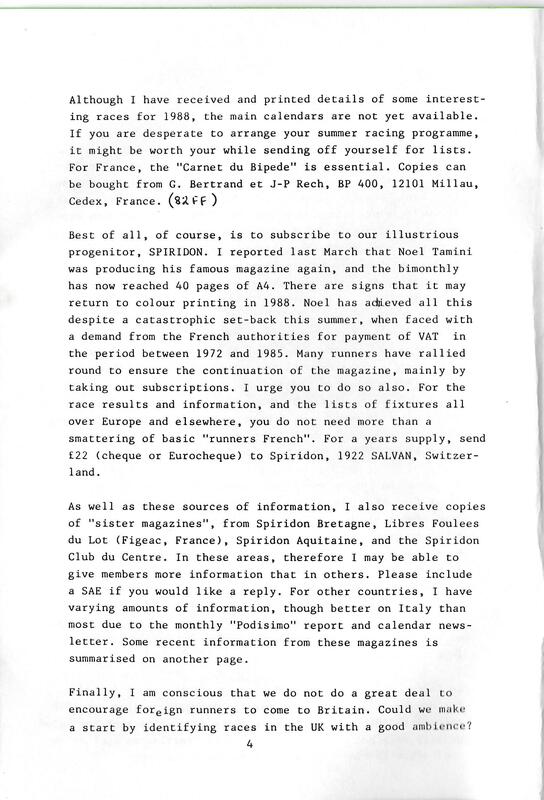 In September 1970 he wrote to Angus Tait, then the area youth and community service officer, requesting his assistance with regard to contacts, etc. 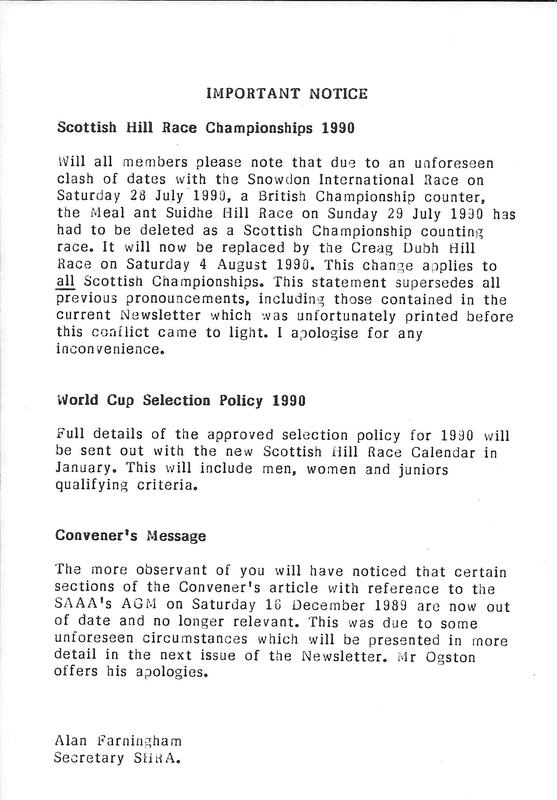 Angus Tait responded by contacting the local Penicuik and District Community Association whop agreed to take on a hill race as part of their programme of yearly events. 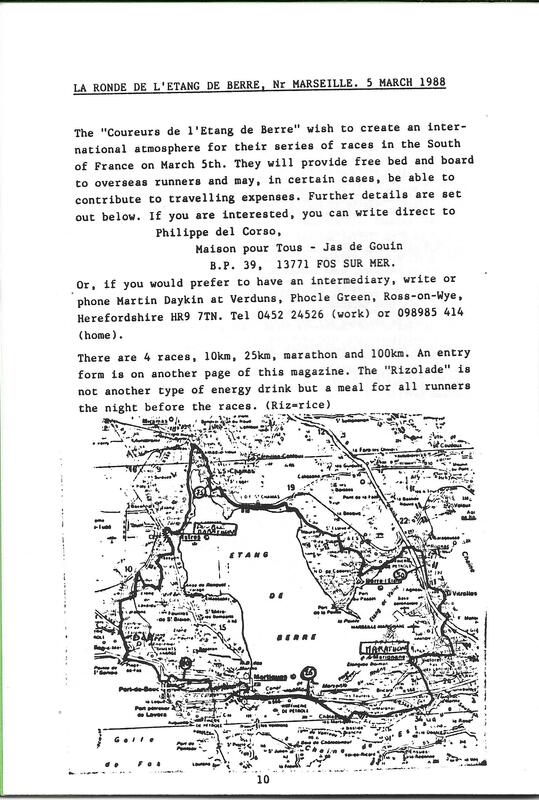 It was also agreed that, to add a bit of interest to the event, it should be as Jimmy Jardine originally wished, run to commemorate the Battle of Rosllin which was fought out in this area in 1302-1303. 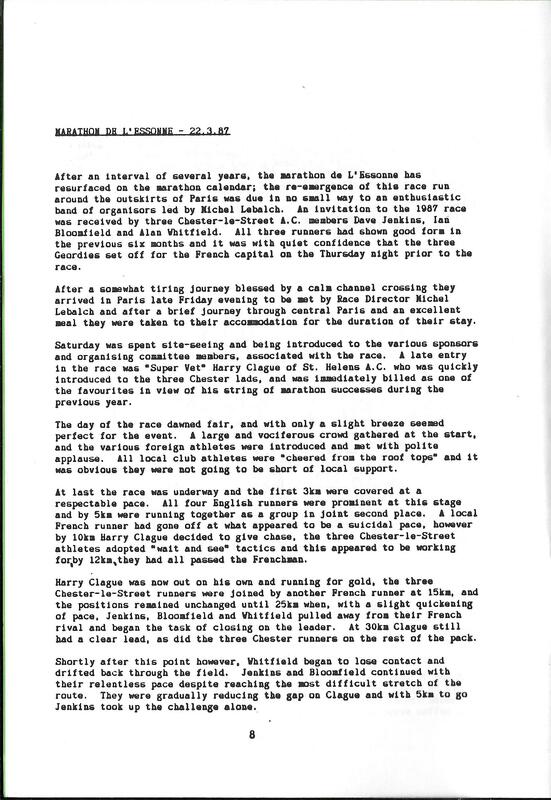 That covers the origins of the race and the programme continued with the history of the race until that date. 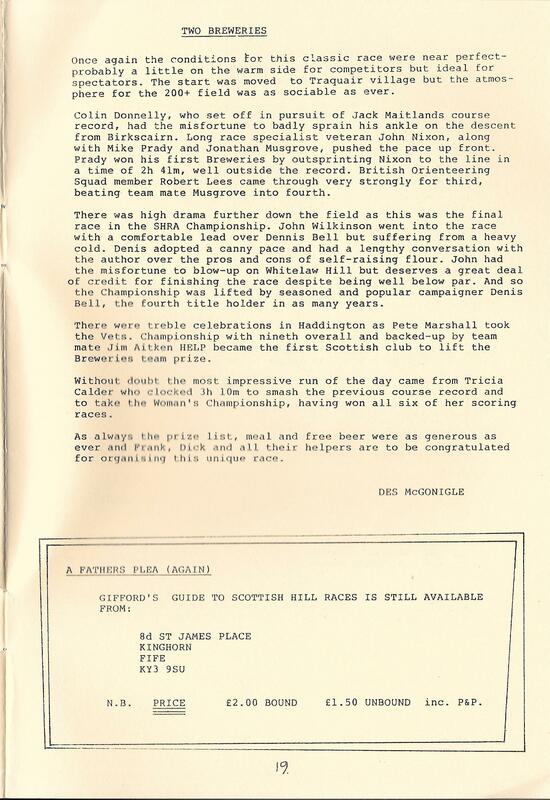 There follows a fairly detailed story of the Battle of Roslin as told by Jimmy Jardine as well as the list of entries from John Blair Fish as number one to Robert Winters at 502. 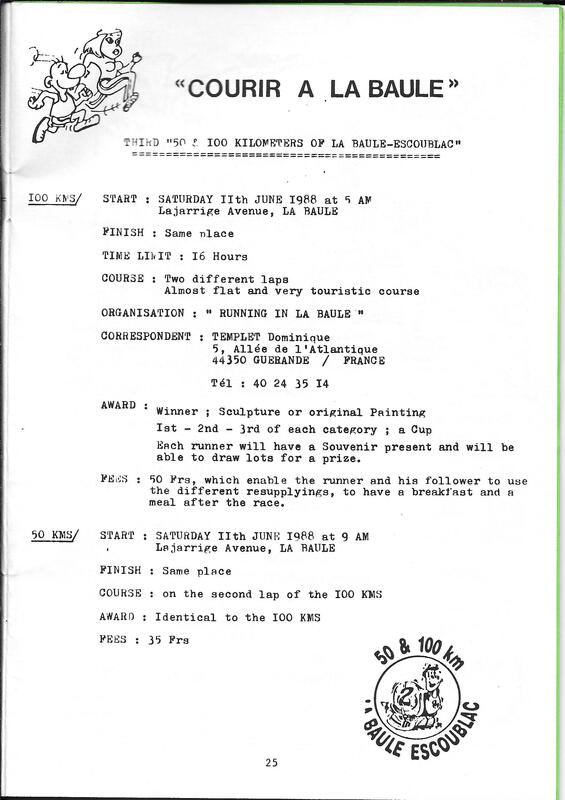 There is of course a map of the trail but the list of trophies on offer is lengthy – no fewer than 28 – along with notes of other awards on offer. 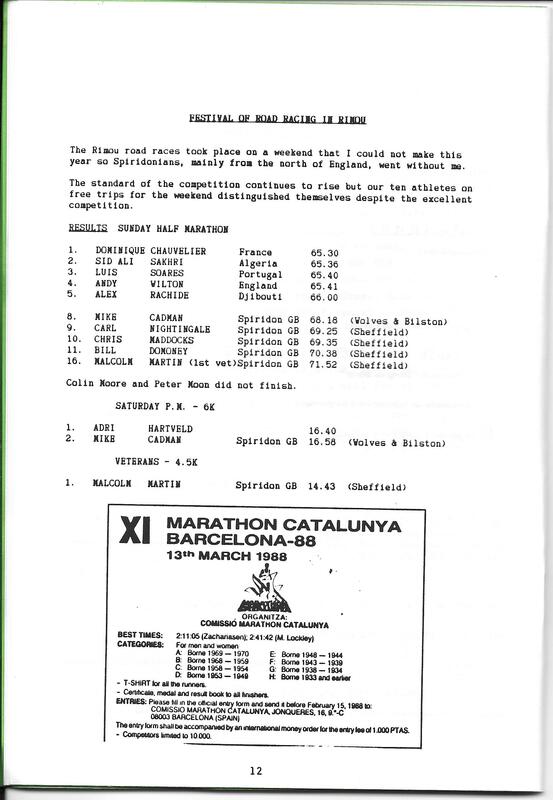 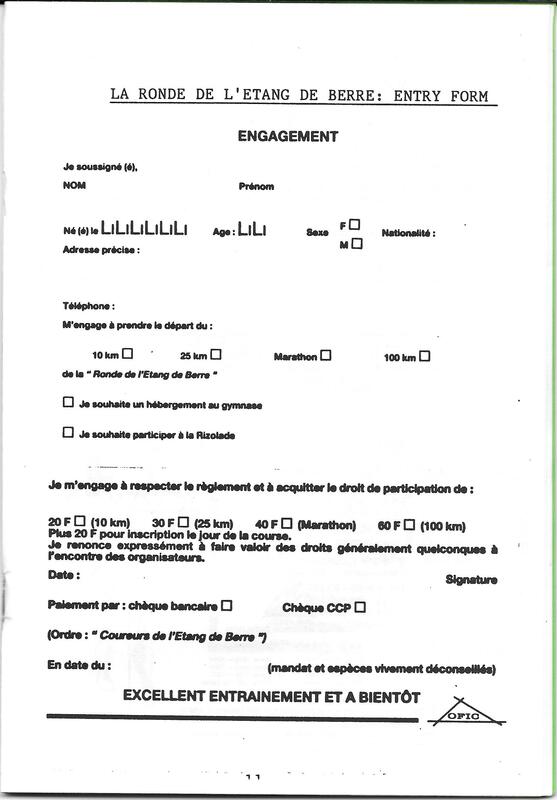 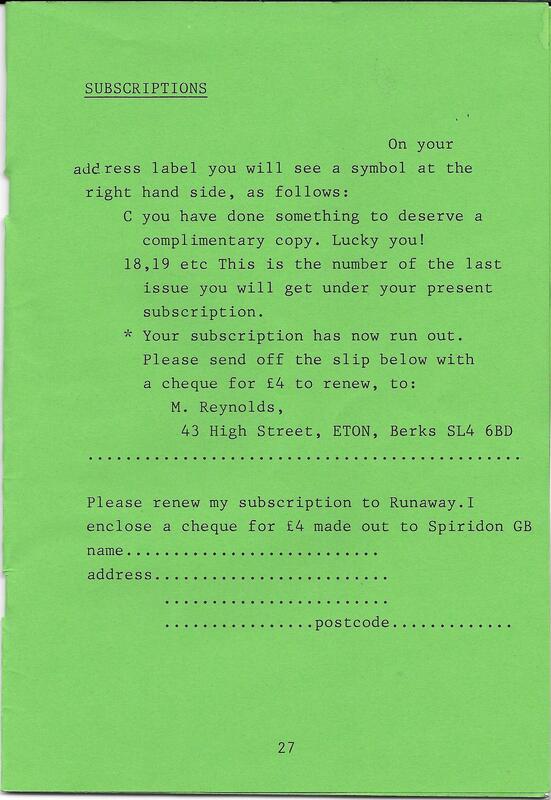 It’s a quite remarkable document. 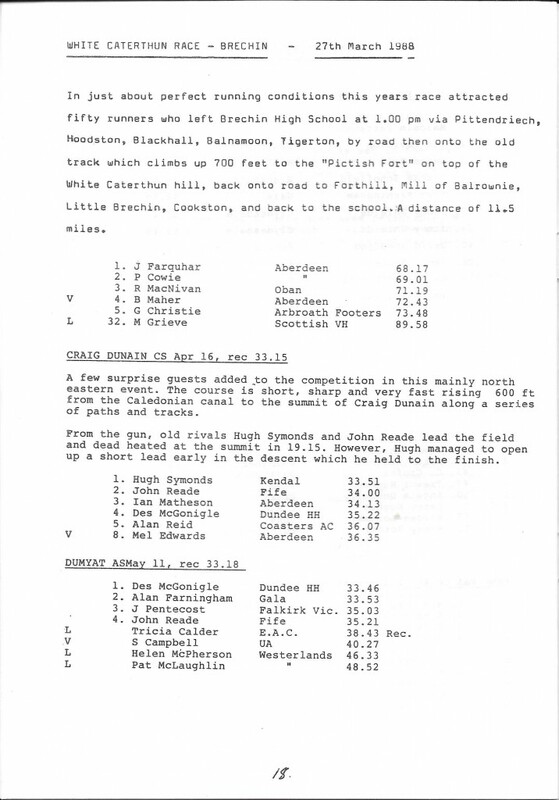 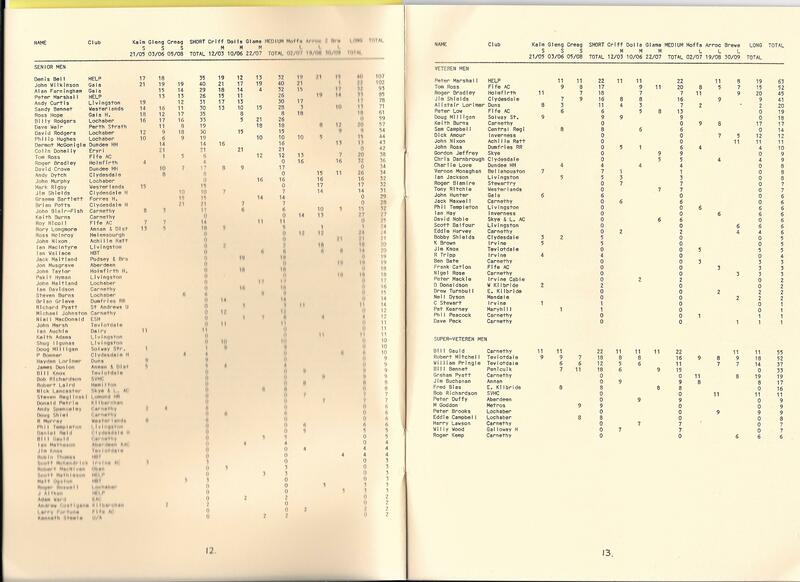 Most race websites only give race results over the past five or six years, if you are lucky they go back to 2000; some races give the list of winners since the race’s inception but the Carnethy Five Hill website gives full results for every year since 1971. 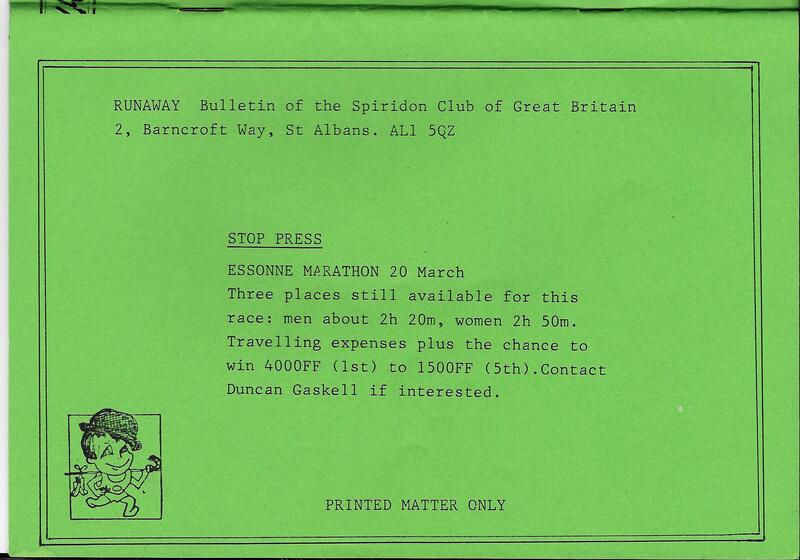 A good race, justly popular, well organised – what more could anyone want? 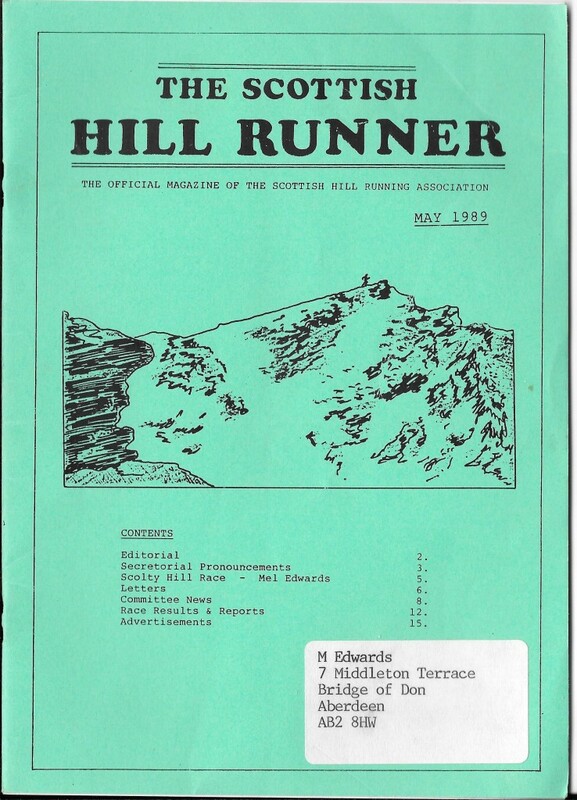 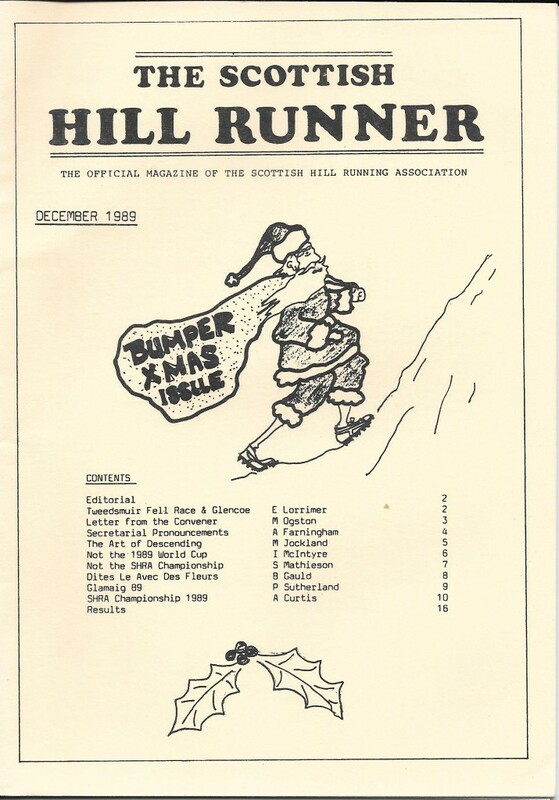 Maybe the weather – Steve Fallon’s Classic Hill Races book says “A tough and popular race early in the hill running calendar. 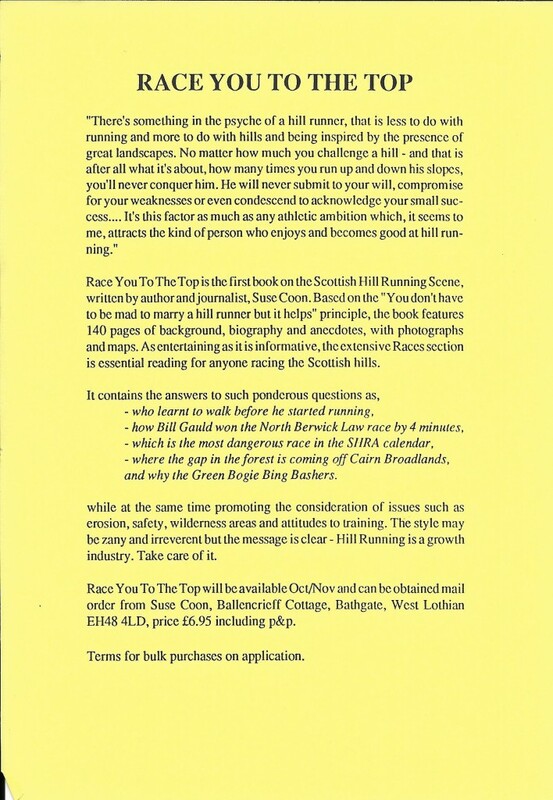 Exposure to harsh weather conditions , steep climbs and sharp descents are a true test of whether the runner’s winter training has paid off.” Well, it is run in February and we are living in Scotland. Harsh though the weather conditions may be, who’s to say the weather will be any better at ANY other time of the year?